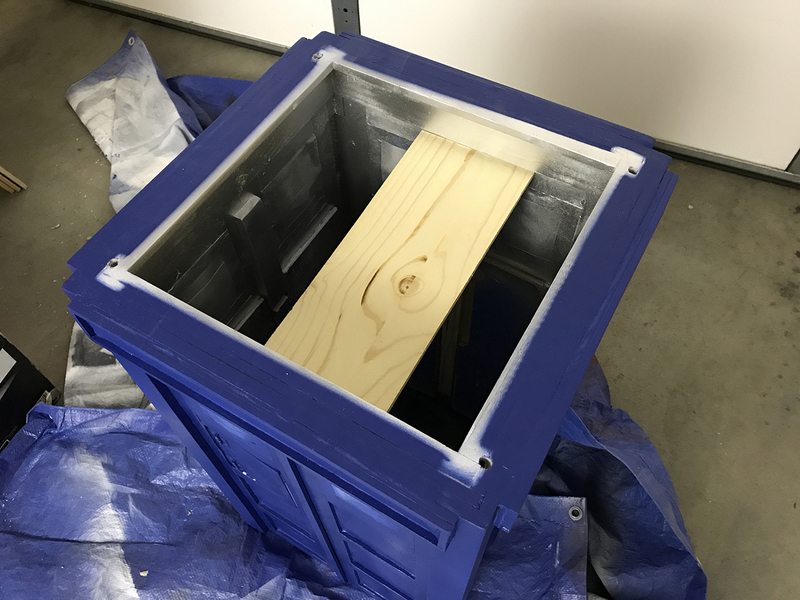 Actually last night I decided against capping the boxes for the signs - the thin wood I'd bought was too thin and fragile, and because it would have been a tight fitting cap over the existing box, I couldn't have added any structural support to the cap itself. As long as the cap was on it would have been fine, but if I'd ever removed it, too much chance of it breaking. As for those brackets...yep they're ugly. I like the idea of a table skirt, and not just to hide the brackets - future posts will cover what I want to do with that. 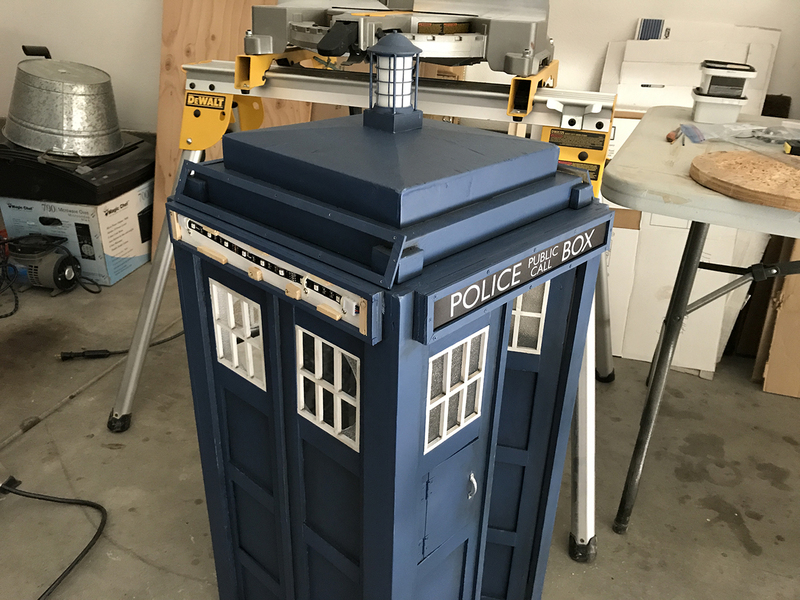 Mainly I was using the brackets on this project because I've had them sitting around for the last 10 years and have wanted to justify keeping them by finally using them on *something. * That being said, I like your ideas and it turns out I have a few leftover wood screws. On the computer structure I'll see about replacing some of the brackets. I'll likely leave the big ones in place at the base. 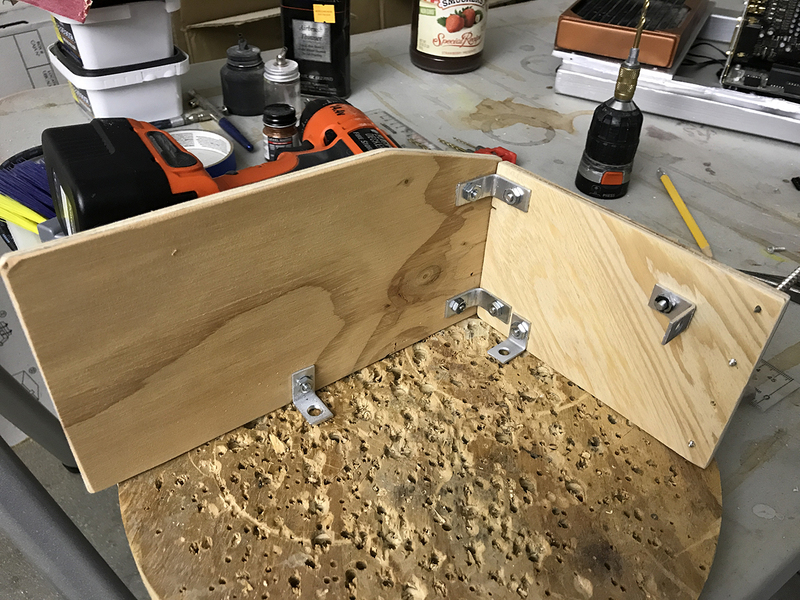 I think the wood screws are enough to hold it all up on their own, but I want to be able to disassemble it which rules out using glue, and the brackets take up the least amount of area while providing extra support on the weight-bearing side. I realized the inside brackets now are completely unnecessary and I'll remove those. And the ones holding the crossbars in place can be replaced with long wood screws. For the table, if I can work out how to do the skirt with the legs angled, I'll leave the brackets in place assuming they are completely hidden. 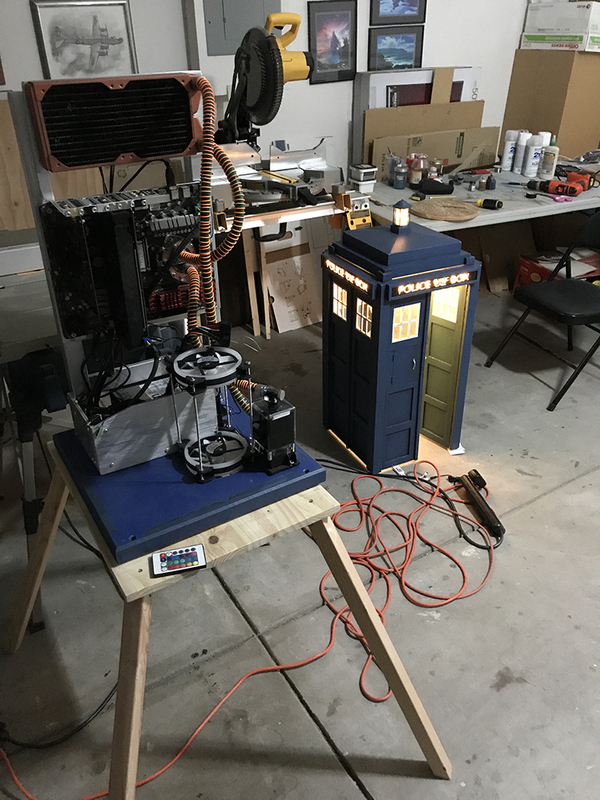 More progress pics - I got the computer mostly reassembled. 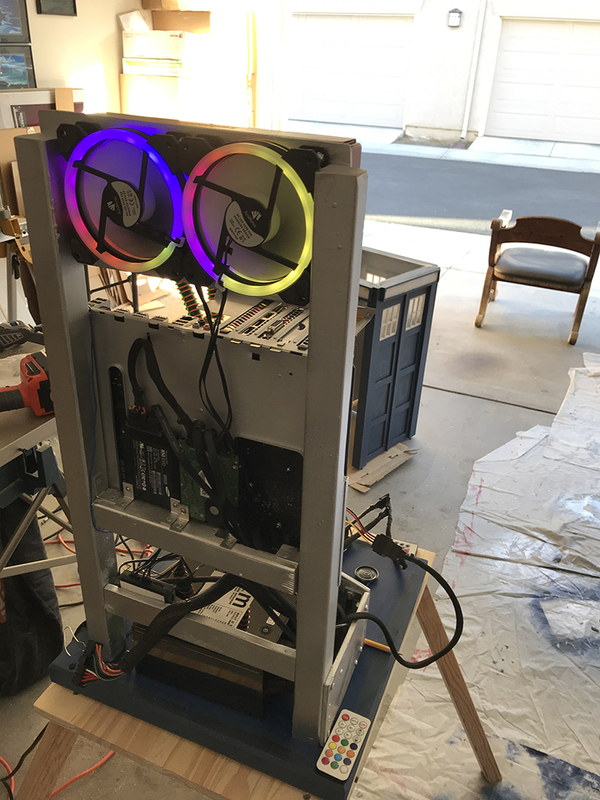 Can't fully reassemble it until the exterior paint job is done and I can put it back on the base, since the pump and PSU will be mounted directly on the base rather than on the structure that holds the rest of the system. I've had green tubing that someone sponsored me on a different project almost a decade ago, 3/8" ID - 5/8" OD. I think they gave me 15 or 20 feet of tubing. After this project I still have 9 feet of the stuff. I've also had a bunch of metal fittings from that same project that ended up being extra. Problem was, I discovered that 4 of the fittings are 1/2" ID and 5/8" OD. The two on the CPU are 3/8" ID. 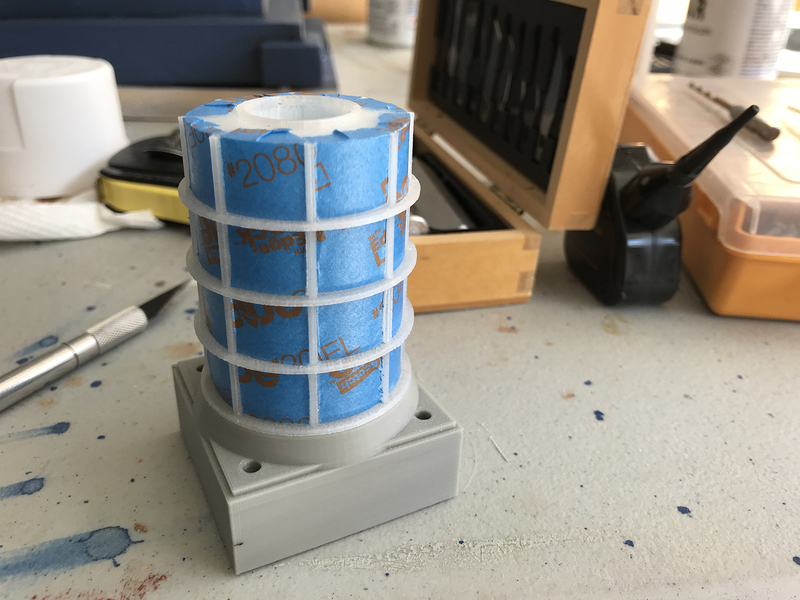 Happily, I was able to cram the 3/8" ID tubing over the 1/2" fittings, once the fittings were screwed into the radiator and pump (and thus didn't move under extreme pressure). Super tight fit but it works, and I didn't have to buy new fittings or tubing. 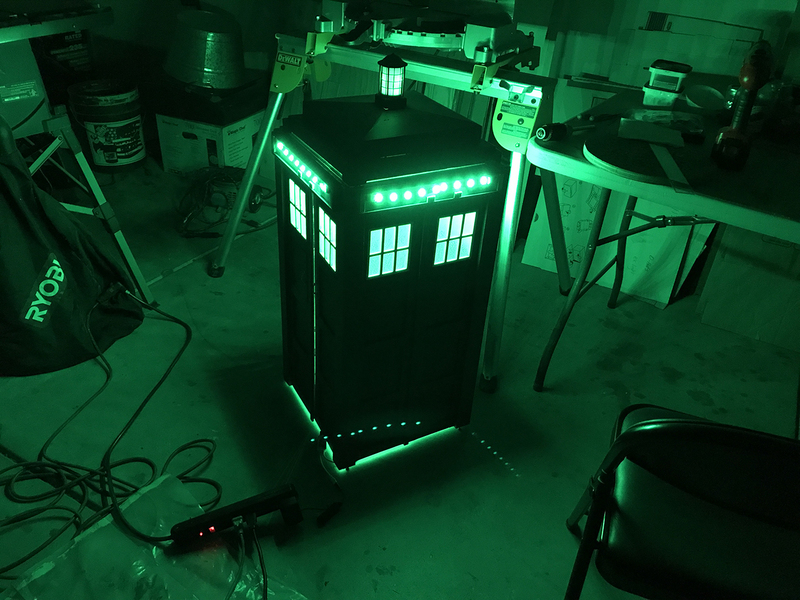 Now, since the tubing is a rather livid shade of green, I needed to do something to help work it into the Doctor Who theme. Enter the sonic screwdriver used by Matt Smith's Doctor. It's copper, silver, and green. 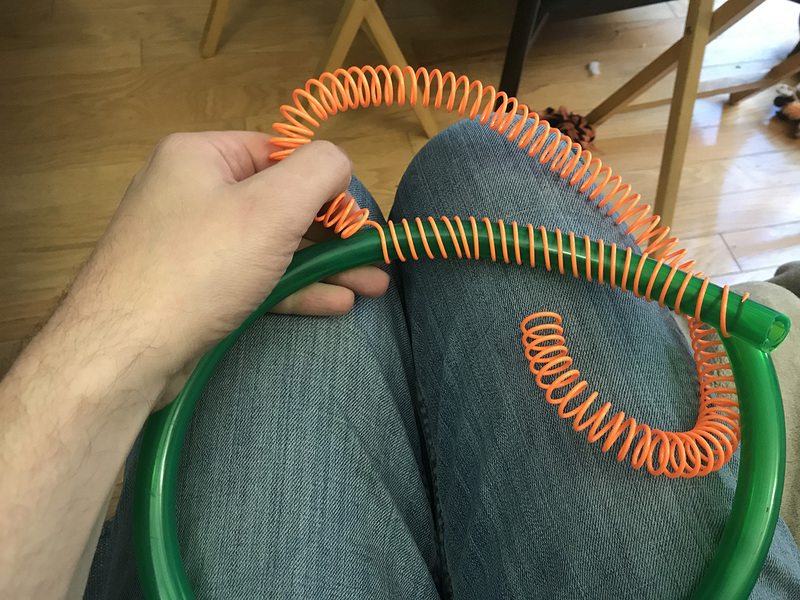 I painted the radiator copper, and bought anti-kink coils for the tubing. I'd intended to paint those copper too, but they took so much manipulation to put on the tubing that I gave up on the idea of painting them - it would have just flaked off. 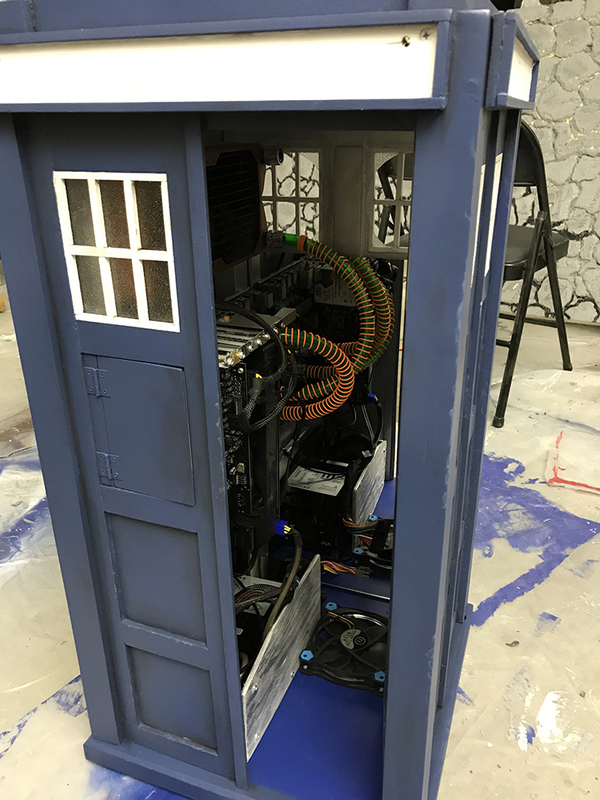 So the tubing is green with orange coil, the inside of the TARDIS is silver, and the radiator is copper. Not 100% what I was going for - copper colored coils would have been ideal but they don't exist. And I've spent enough $$$ on this project already. (*edit* - it occurs to me, of course AFTER I've done all this, that I could have tried copper wire to wind around the tubing. Eh well. The orange will be more noticeable, and I don't feel like unwinding it all and rewinding new wire). 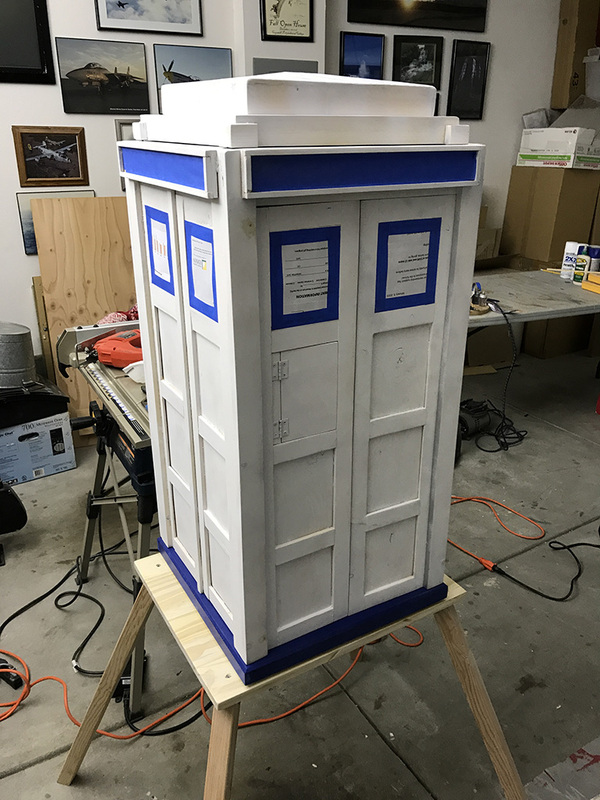 Now on to the exterior. 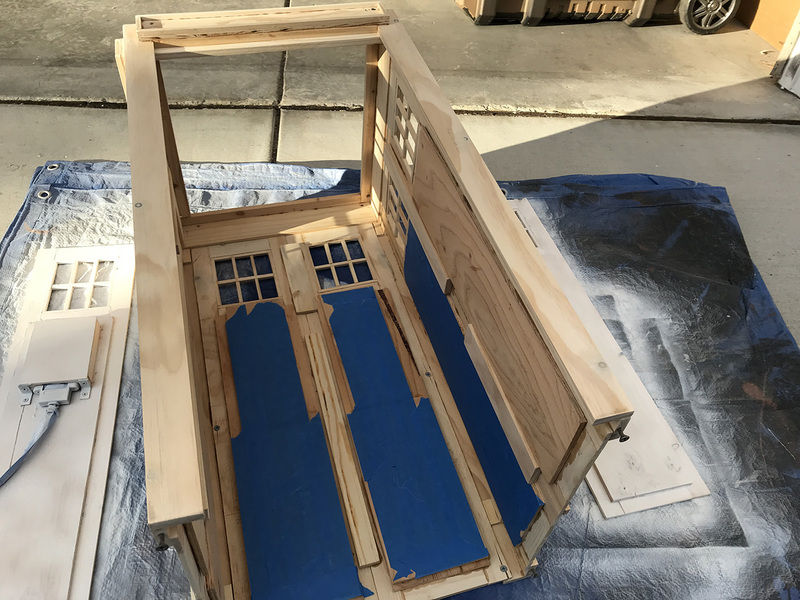 Lots of wood filling, sanding, priming, and masking... 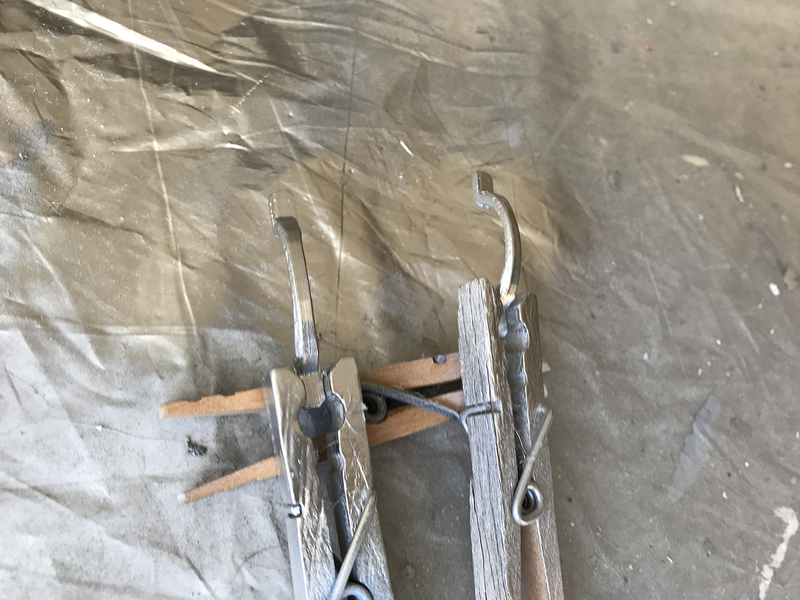 It turns out that the wood glue doesn't respond to sanding...like at all, so I may have to go back and chisel it off and then use wood filler on the seam. Ugh. 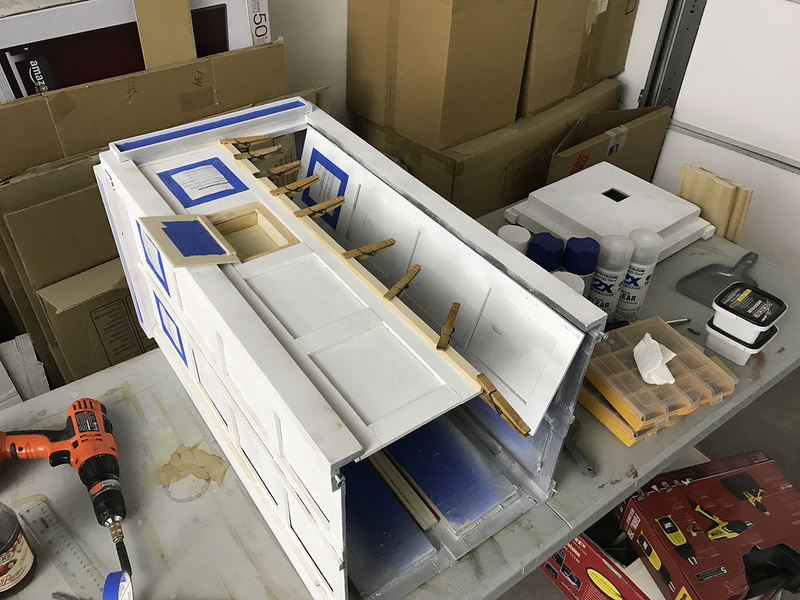 I've primed the whole thing, but discovered that there were a number of spots that needed more wood filler, not to mention new screwholes from adding those front panels on. 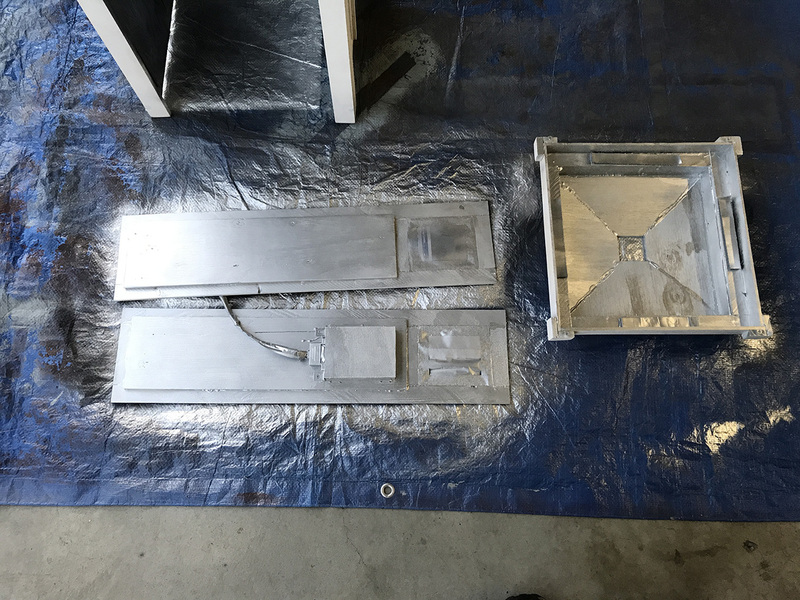 Not a huge deal - I still needed to prime the inside of the phone box on the left front panel, as well as the center strip that runs vertically between the side panels (hadn't added it to the front yet, see the last picture in this post). 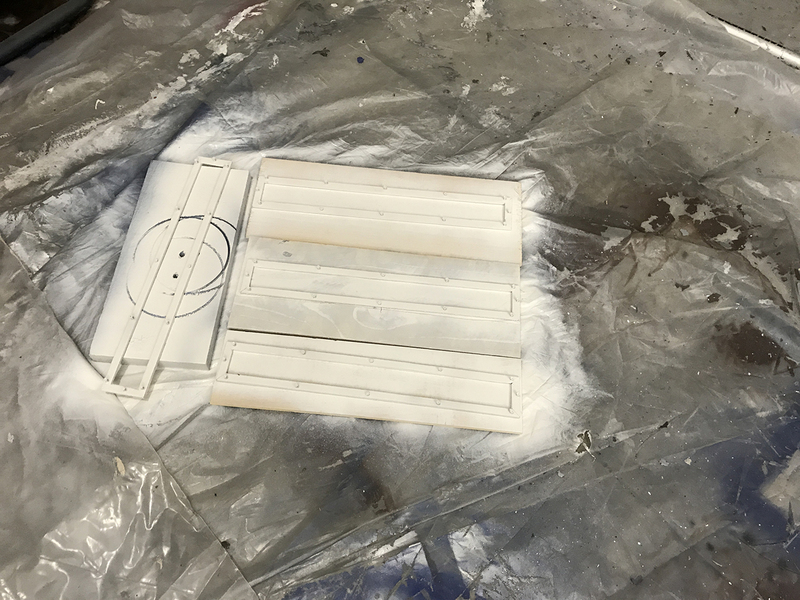 Made some more painting progress, and rebuilt the little wall that'll go around the PSU. 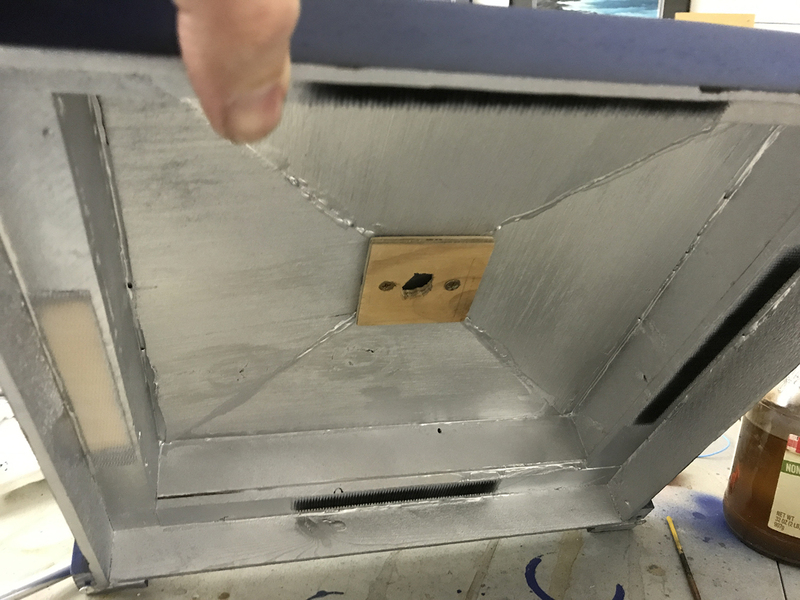 This time the brackets are on the inside. 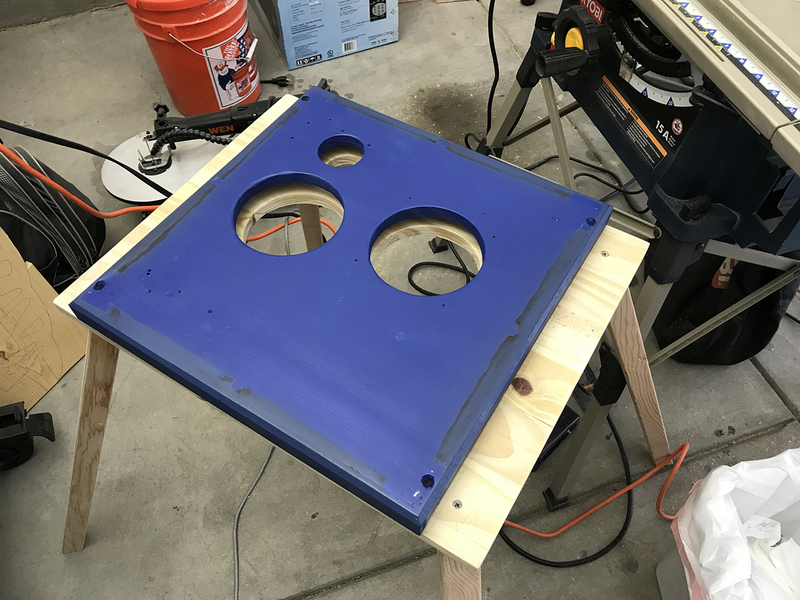 Most of the screw heads on the outside won't be visible when the case is all put together. A couple will but that's ok. 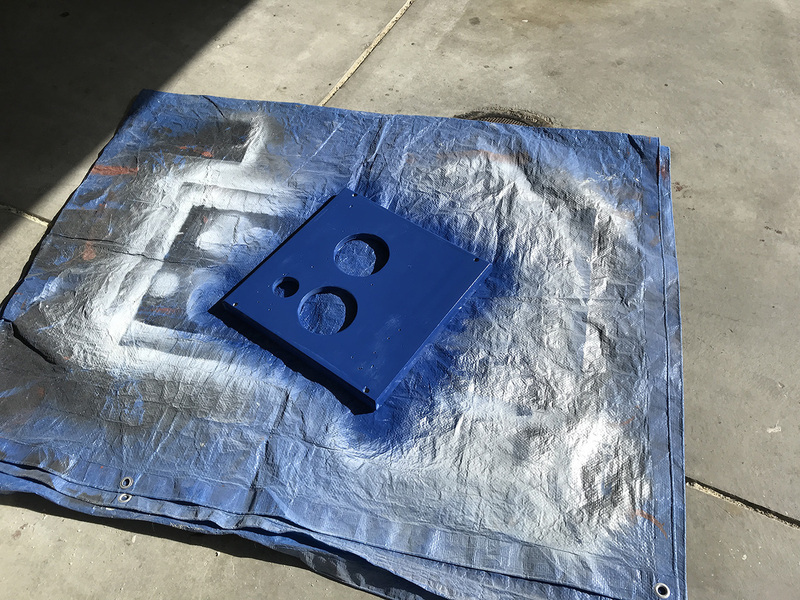 This was the initial blue spray paint color I used. 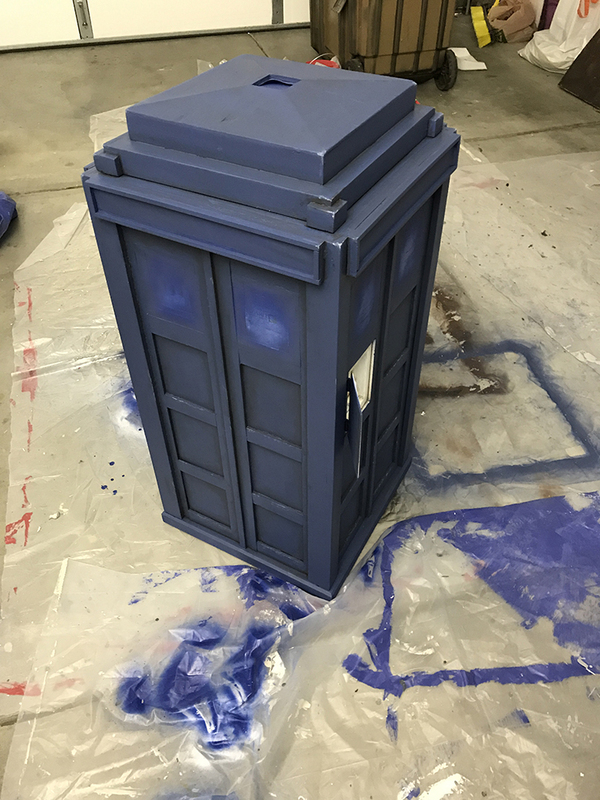 It's kinda close to the Matt Smith/Peter Capaldi TARDIS, but this spray paint was less purple. 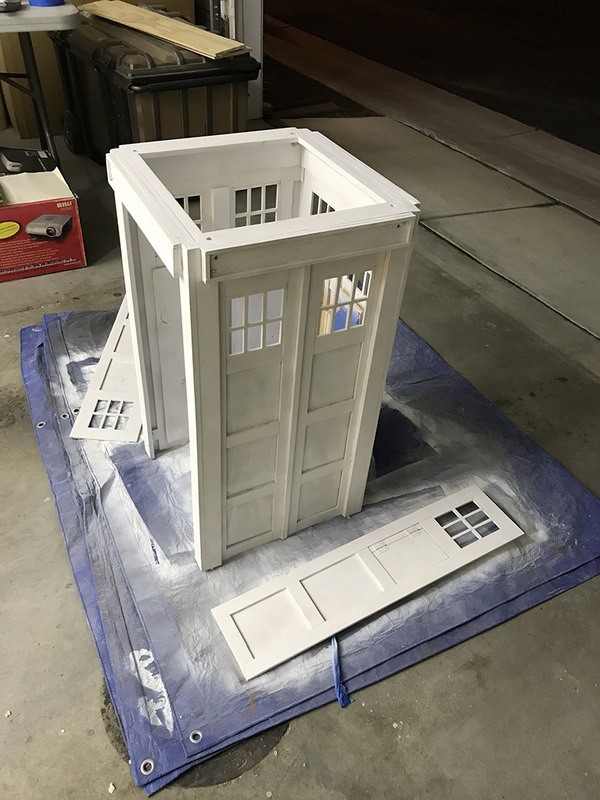 I'd used it because while I intended to airbrush the exterior, I wasn't sure I'd have enough paint to do so and I was thinking of doing a relatively thin coat through which this base coat would still be visible. 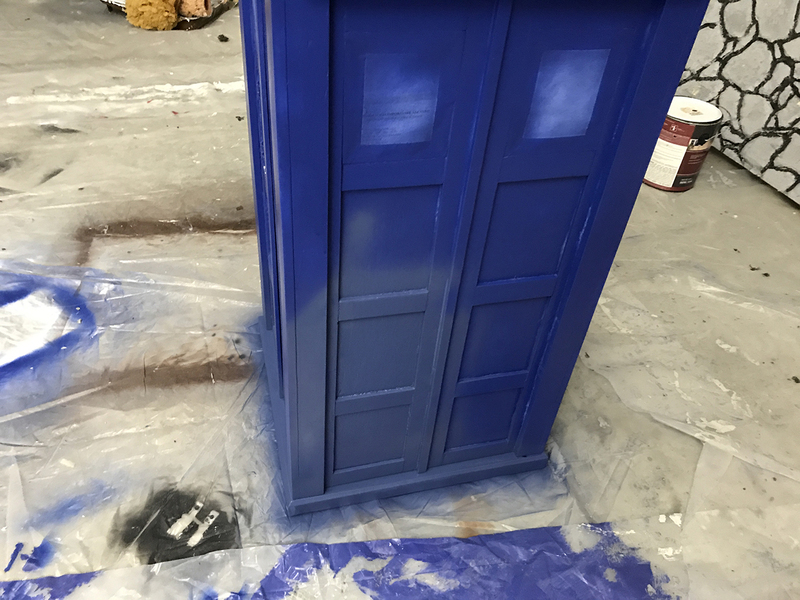 Turns out I have way more than enough, so this brighter blue will now only be visible as the floor inside the TARDIS. Old and new wall pieces. 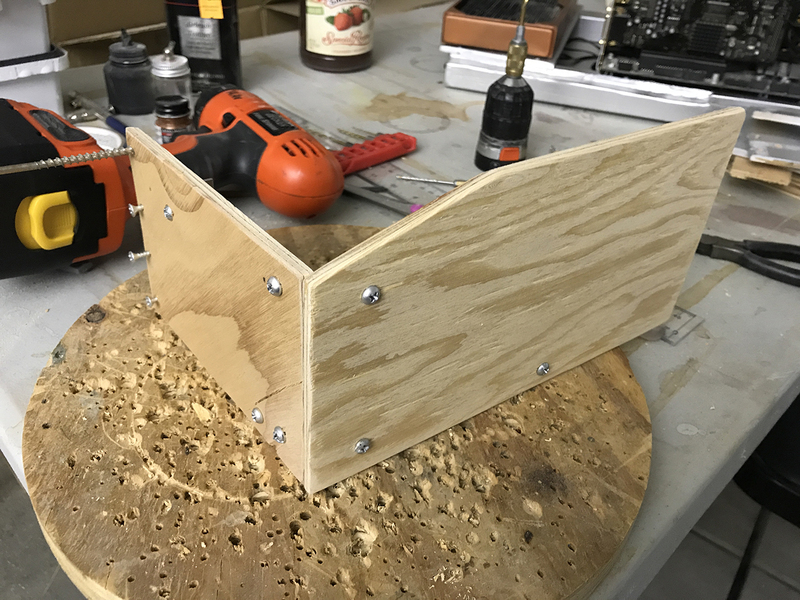 The front part was two pieces because I'd been using bits of scrap wood; the new one is a single piece. I decided to make the new one since the spots where the brackets used to be were still visible after repainting. 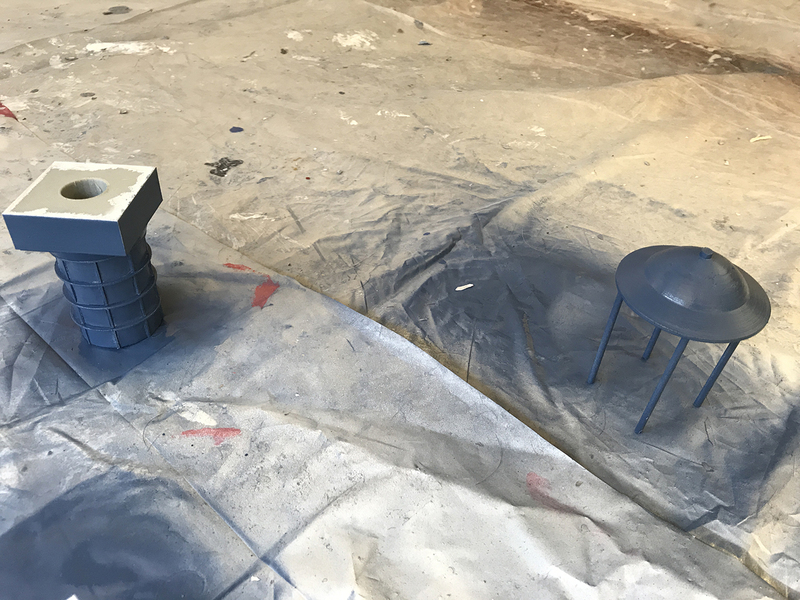 I also painted the bases of the brackets that might be visible the same color blue as the floor to minimize them standing out. This mirror is on the ceiling inside. It still has protective film over it, hence the cloudy appearance. That and it's reflecting clouds. 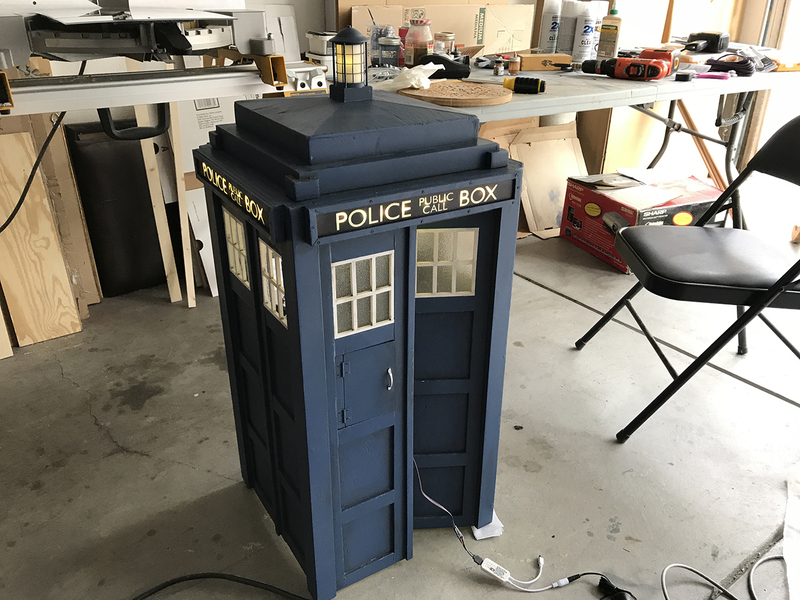 I used sticky-backed Velcro on all four sides to hold it in; I wanted it removable so I can get to the lamp wiring if the LEDs in there ever die. 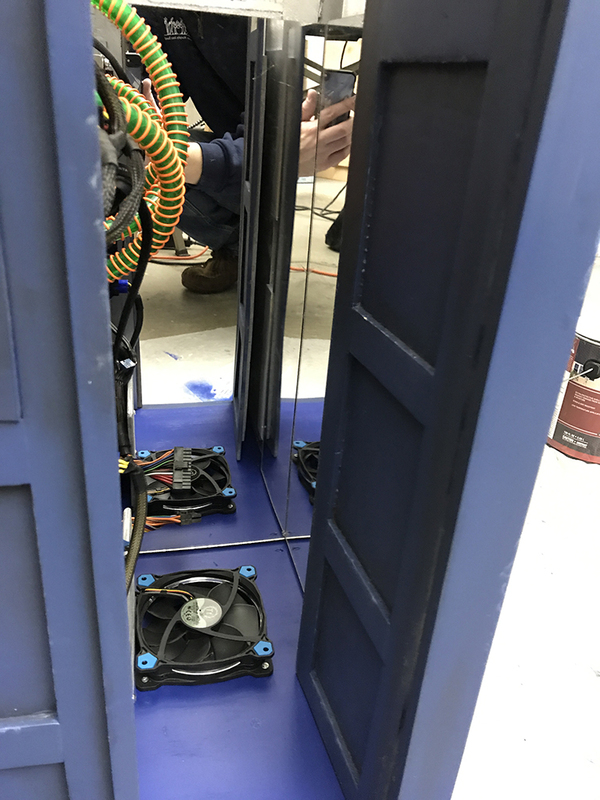 This mirror will be in there along with a mirror on the back wall and half a mirror on the right side wall, to hopefully help make this look bigger on the inside. I didn't do mirror for the other half of the right wall as you can't see it when the door is shut, and when the door is open the door covers that part of the wall. On the left side, so much of the wall is covered by the computer parts I didn't bother with a mirror. 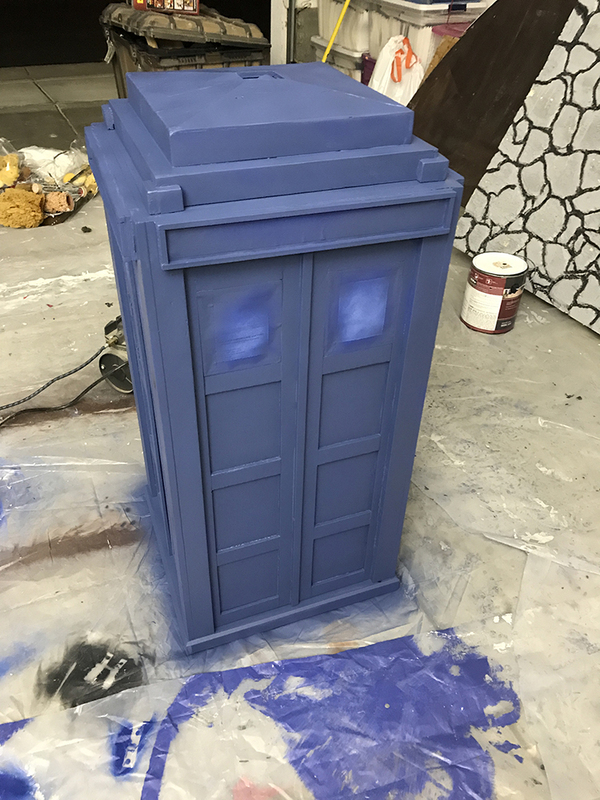 I then prepped a piece of scrapwood with primer and the same blue spray paint I'd already used. I wanted something to test the airbrush color on as I mixed it. 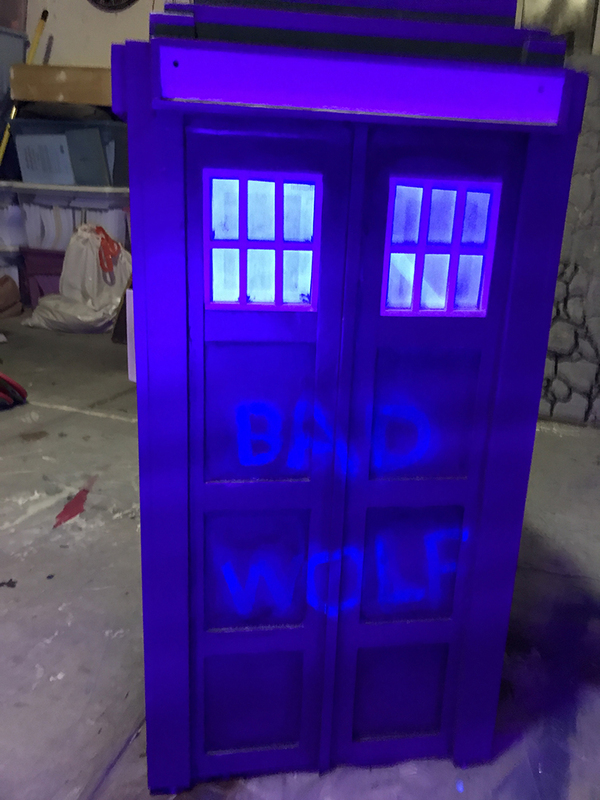 I also did a little test with some transparent UV paint...you'll see (hopefully in the next couple days) what I plan to do with that. 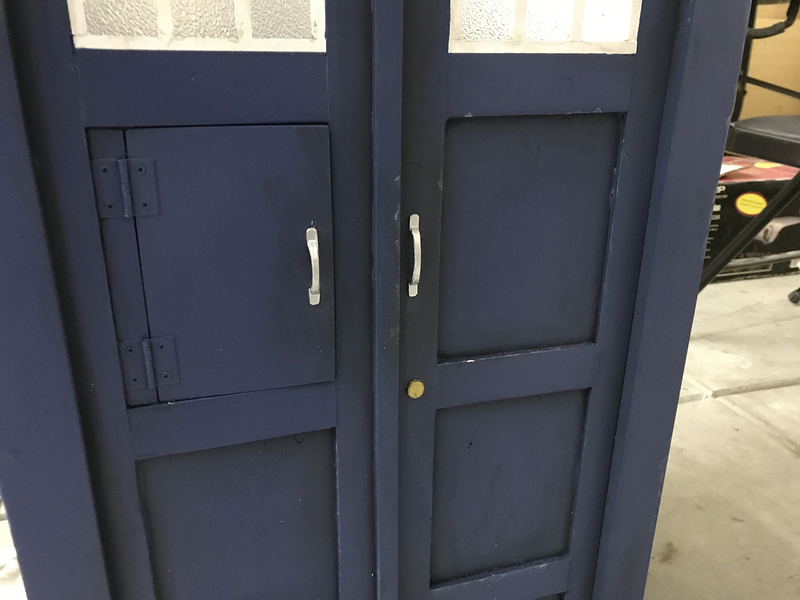 I didn't feel like trying to mask inside the door - the wood door is a bit warped such that the door closes all the way at the bottom, but not quite all the way at the top. Or maybe it's the permanent panel next to the door that's warped, not sure. Rather annoying. 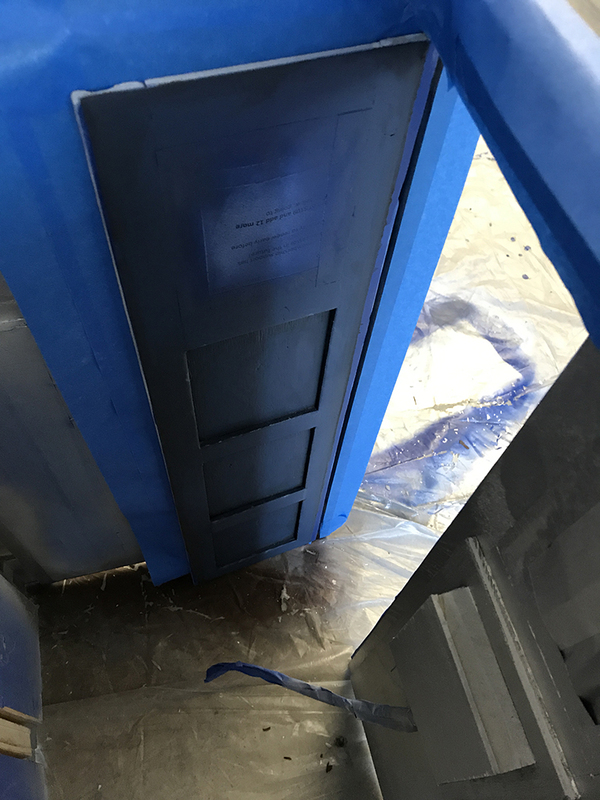 So I wedged this piece of wood in to keep the door fully shut while painting so I wouldn't have to do additional masking. It's possible I'll have to do a little touch up inside, but hopefully not. And here we have the innards and the... outtards? (Incidentally, that "rock" wall in the background is one of two my wife is creating out of 4 foot by 8 foot pieces of foam, they're set pieces for a musical theater show). 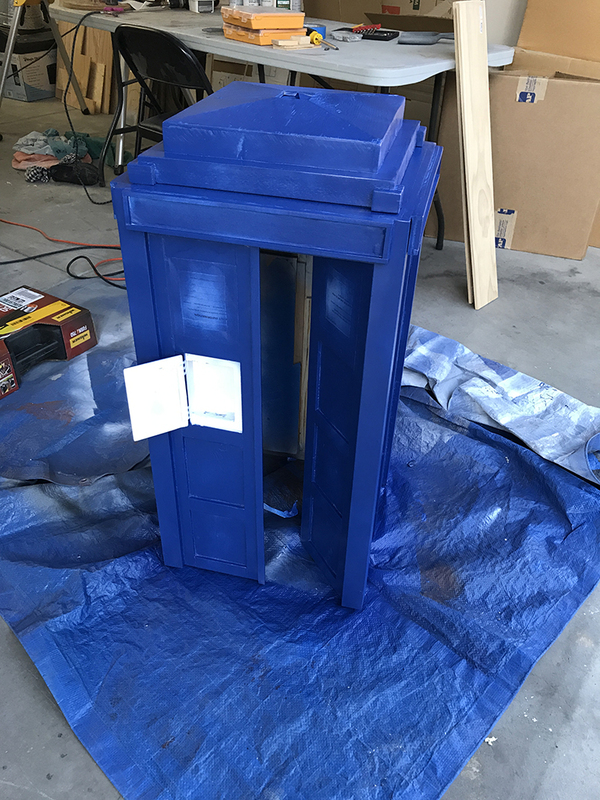 I spent a good chunk of today mixing blue paint. 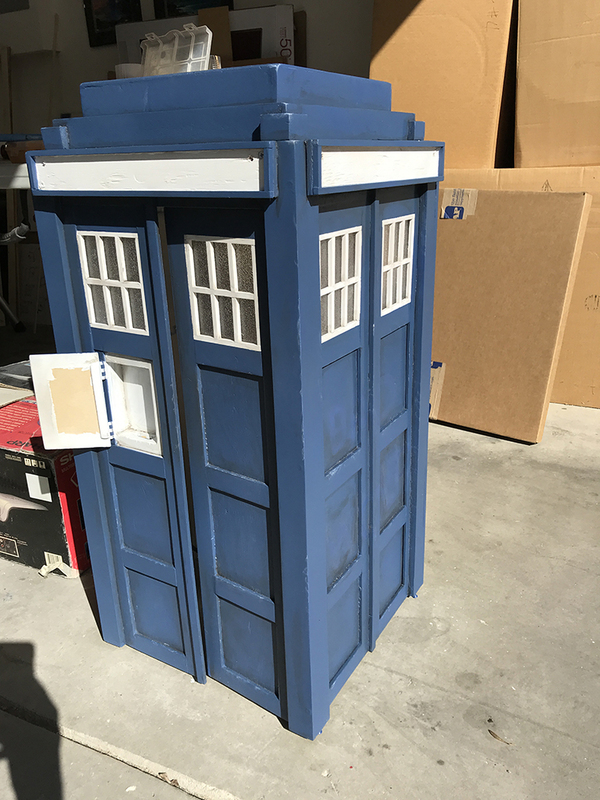 It's really, really tough to tell what color any of the TARDISes actually are. They look a bit different under different lighting. 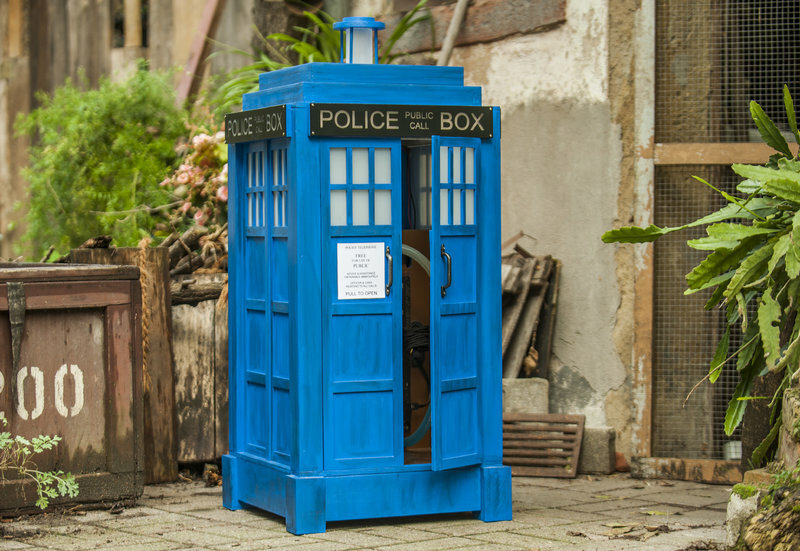 The Smith/Capaldi TARDIS is pretty consistently a purplish-blue, and looks brand spanking new. 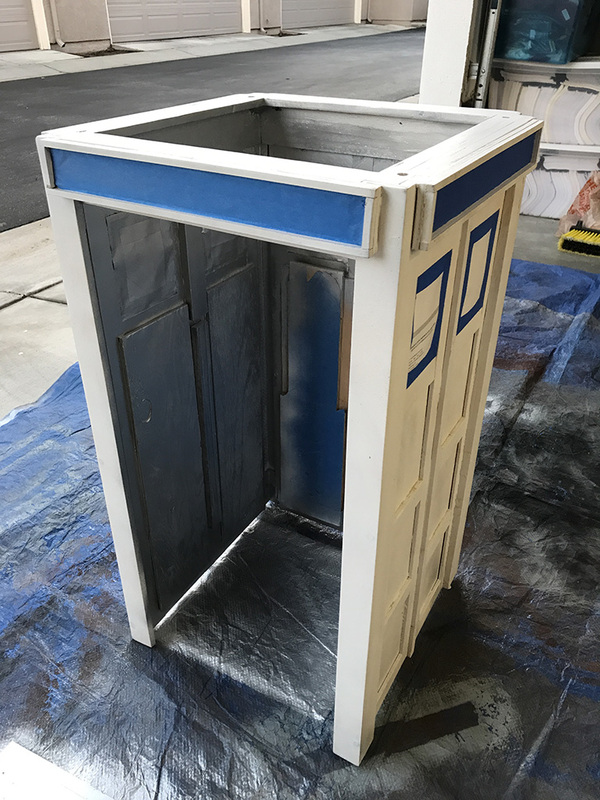 The Tennant TARDIS is grayer and looks older and beat up. 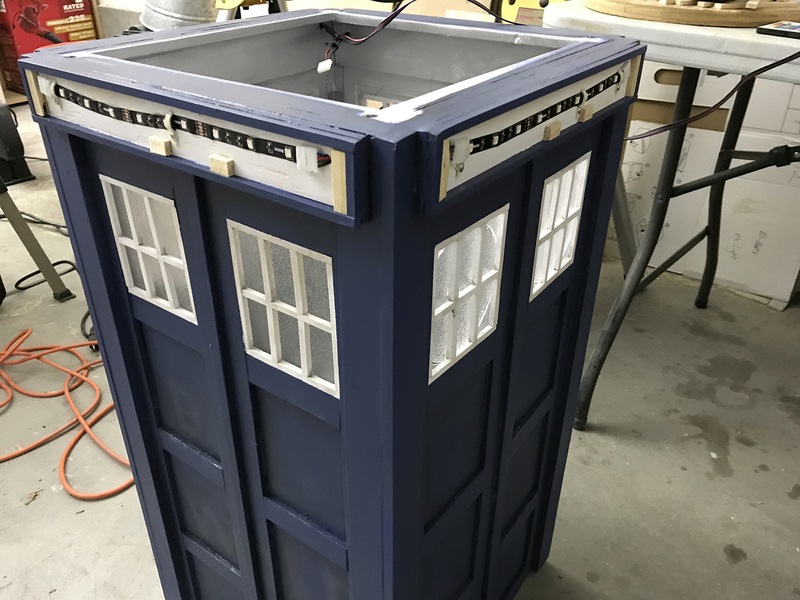 The Whittaker TARDIS is much greener and also looks worn and used. 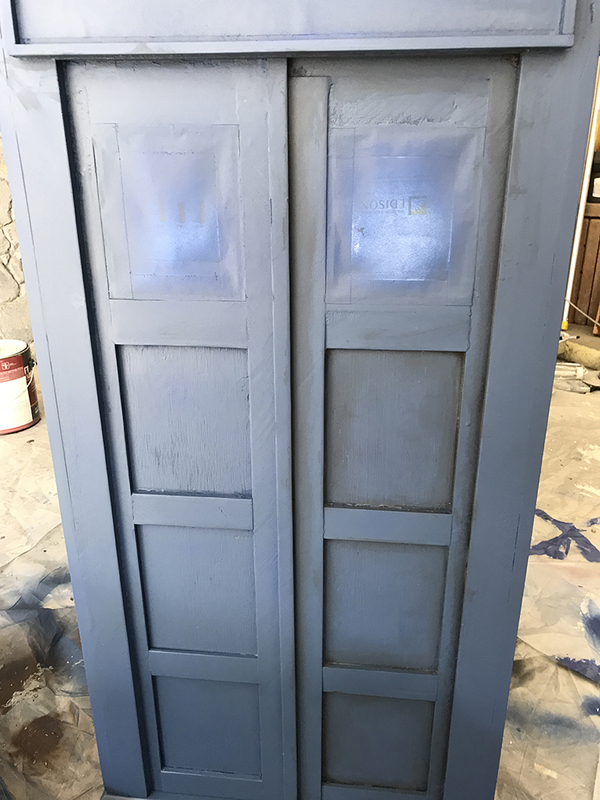 I liked the weathering and the grayer color of the Tennant TARDIS so I was aiming to get close to that color. 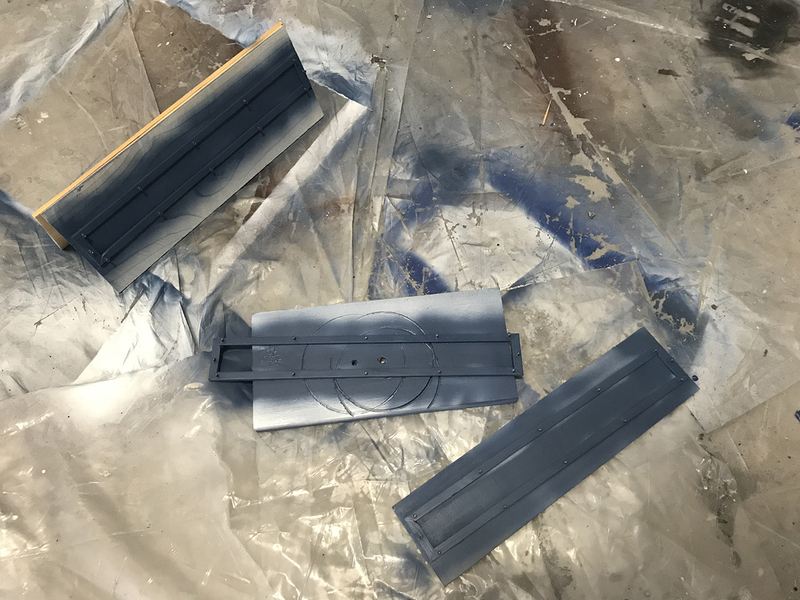 I think the real color is still slightly more purple than what I came up with, but I was working from model enamel paints that are based on military colors. 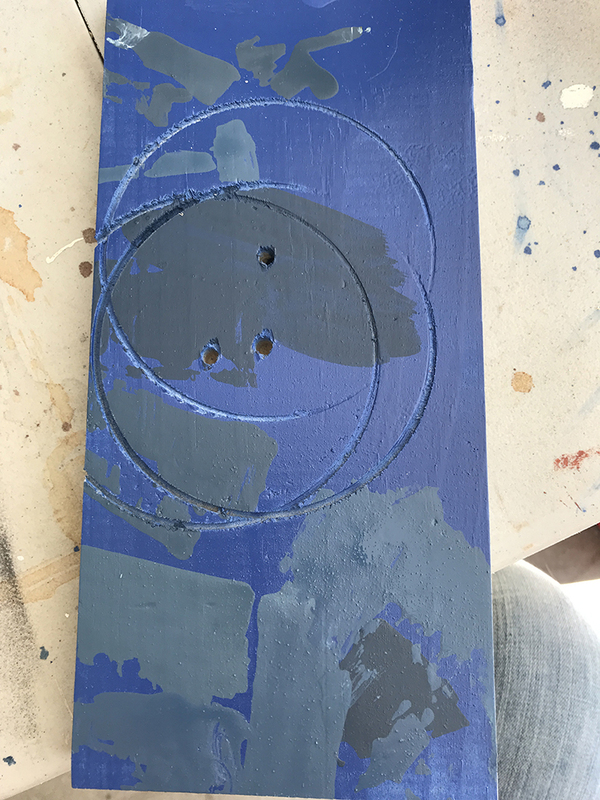 Military blues, I've found, tend to be quite gray, and I had a hard time (by the time I'd figured that out) getting it back closer to a blue or purplish blue. 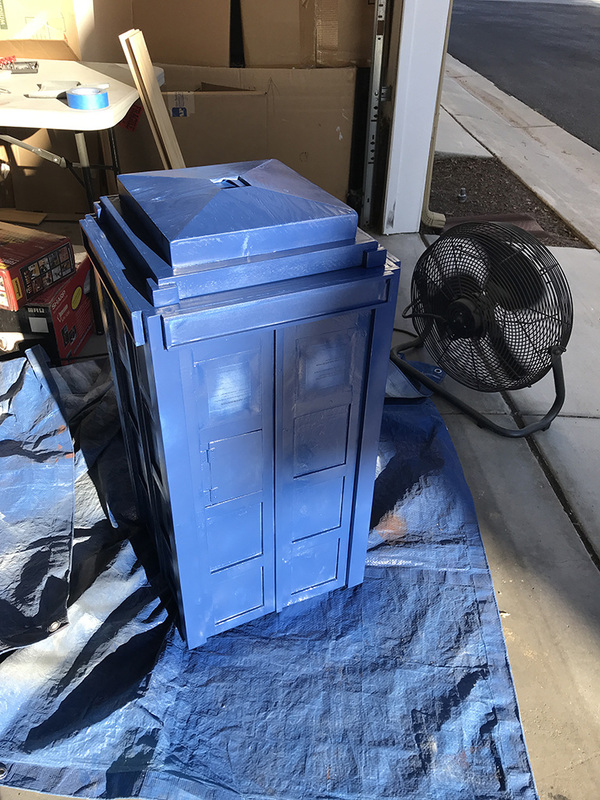 My wife liked the color I came up with, so I went ahead and airbrushed it. 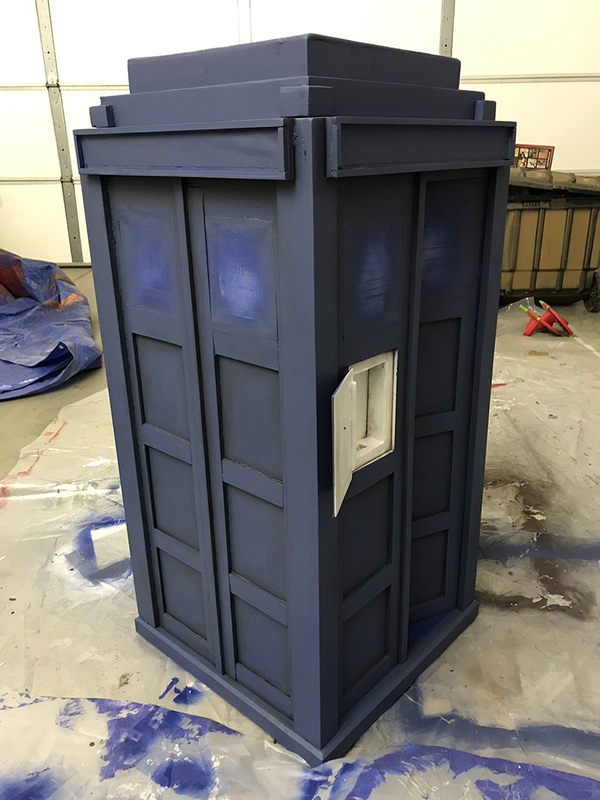 I'm expecting to have to do another partial coat in the morning when I can see it in daylight, I'm sure there are spots that could use a second coat. 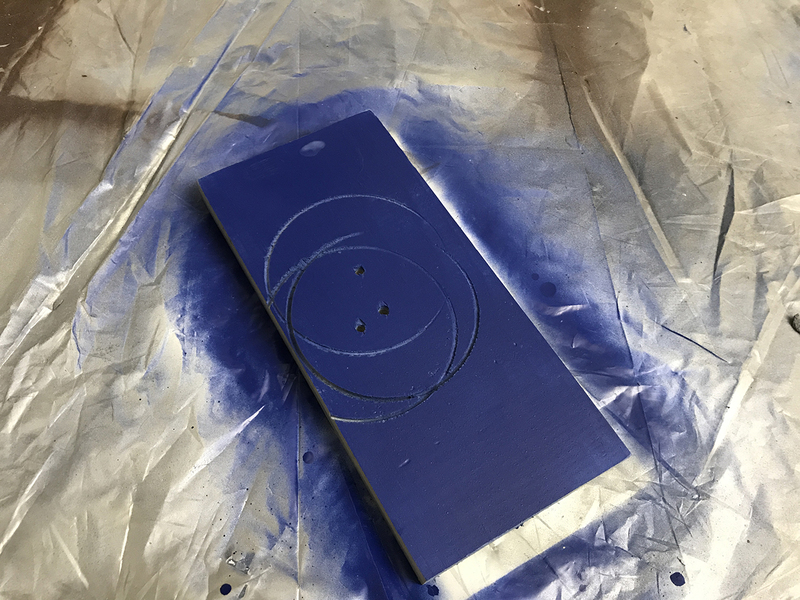 This first pic is that piece of scrap wood - I was testing out all the different blues I came up with. Once the airbrushing is done I plan on doing a black wash to get in the crevices and emphasize those shadows. 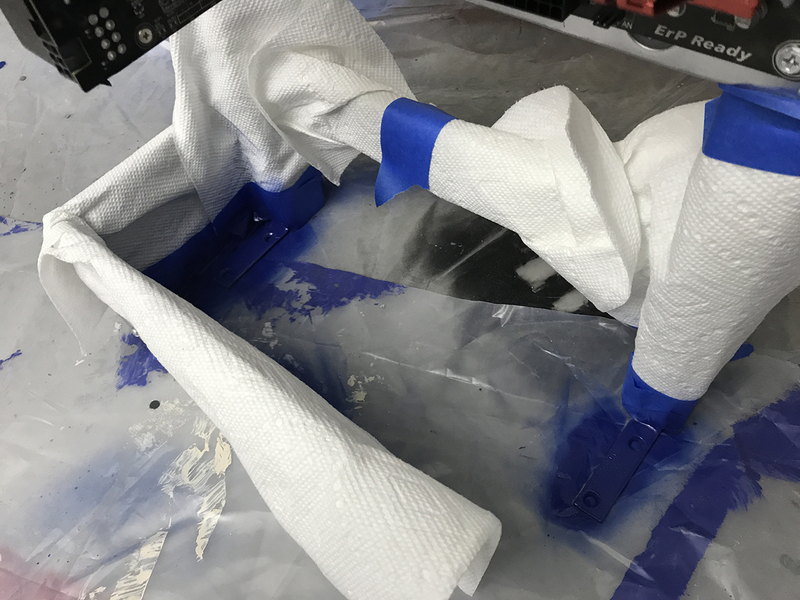 I may do a thin airbrush coat of the blue again over that depending on how strong the wash is. 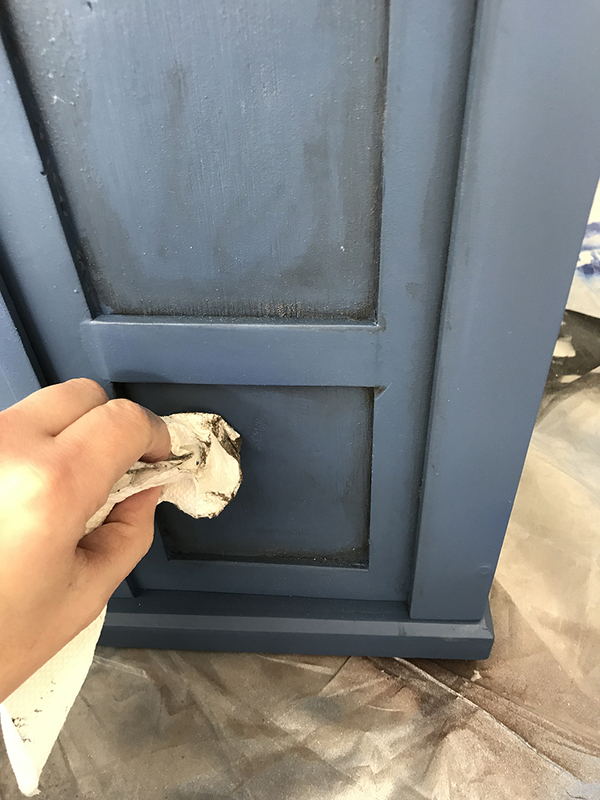 Then there's one more thing to paint on there (that'll be a surprise for later), followed by a clear flat enamel coat to seal it all. 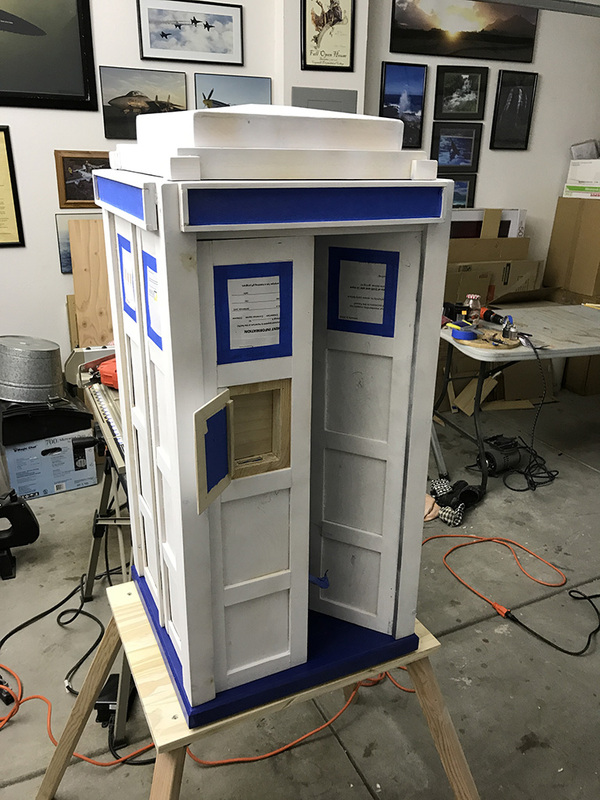 Once painting is done, I can do the wiring, the police box signs, and the interior lights. 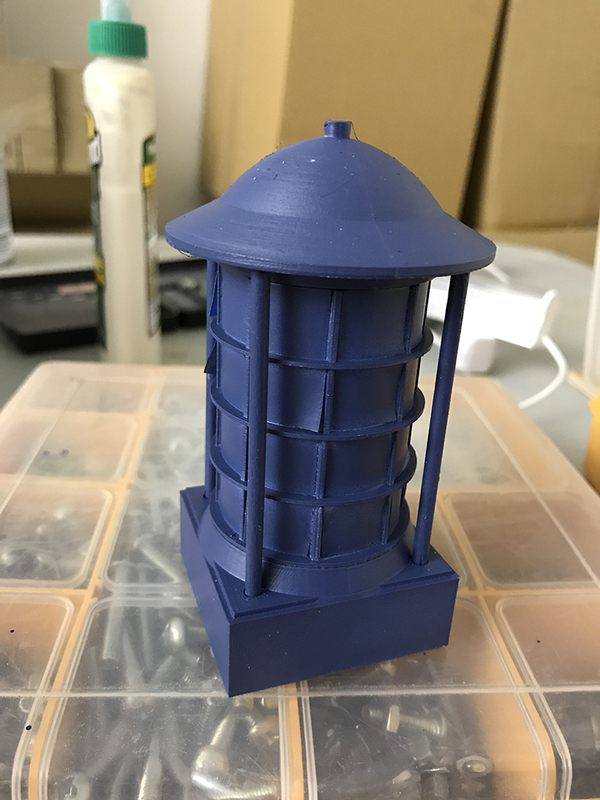 I'm also waiting for the parts I had 3D printed - the lamp on top, the door handle and lock, and the telephone panel handle. I also need to make the telephone. And I need to have the signs made for the phone box and the round St. John's Ambulance sign that goes on the door. I'm shocked half of BitTech hasn't posted CMYK or Pantone codes for the color you want. 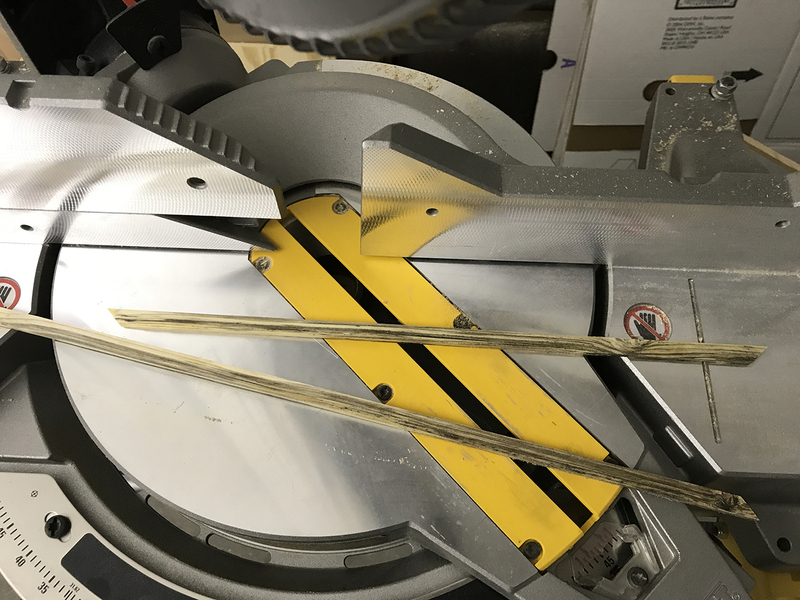 Wood warp: No shock with the way hardware stores handle wood. so it was not too bright. On to the weathering! I'm really, really happy with how this has turned out. The paint job is pretty much done at this point. 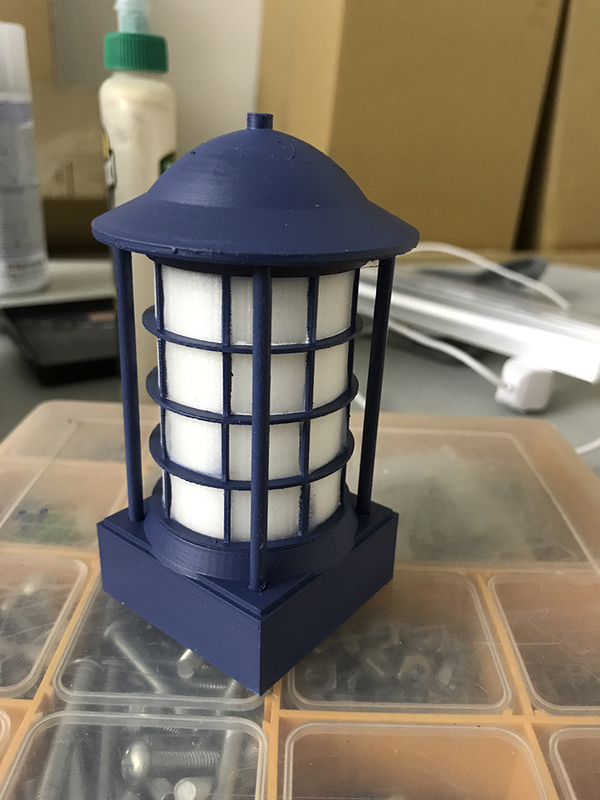 I'll still have to paint the lamp, door handles, and door lock which I expect to receive later this week from the guy who printed them for me. But that's it for paint. I used a black (really brown, but the label says black) acrylic wash. I worked it into the corners with a paint brush, then used a paper towel to wipe it around and pick up excess. Super tedious, the whole thing took a couple hours for that step. But it was 100% worth it. 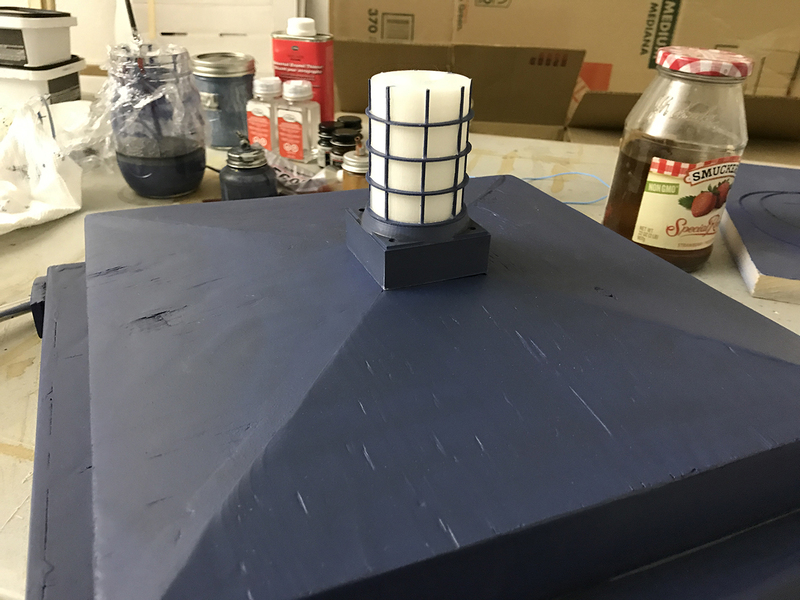 I also drybrushed a little white onto some of the edges and corners to bring them out as highlights and to give the appearance of small paint chips. In this photo the right side is weathered and the left side is not. The difference was more obvious in person. Also, for reasons I can't figure out, my iphone keeps making the paint look really gray. In later photos below the color accuracy is better, it's quite blue. The base. 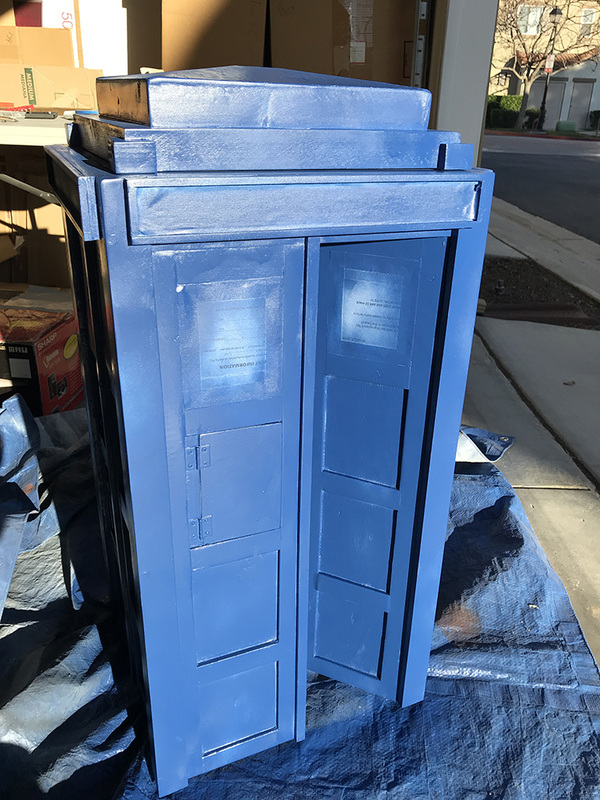 You can really see the difference between the spray paint blue and the airbrushed blue. 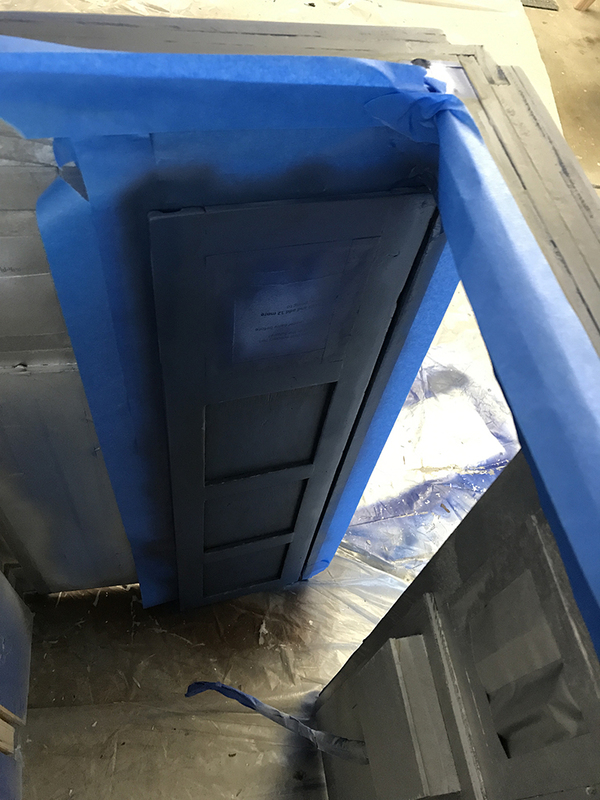 I had to get the edges of the door painted that I'd missed on the initial painting because the door was shut. 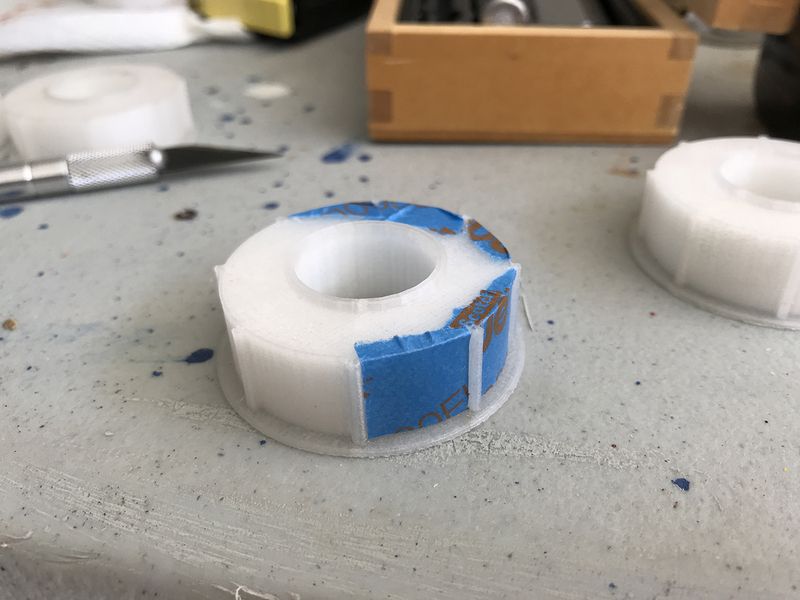 Lots of tape and some quick and careful airbrush work and that problem was solved. I re-weathered those spots this morning. 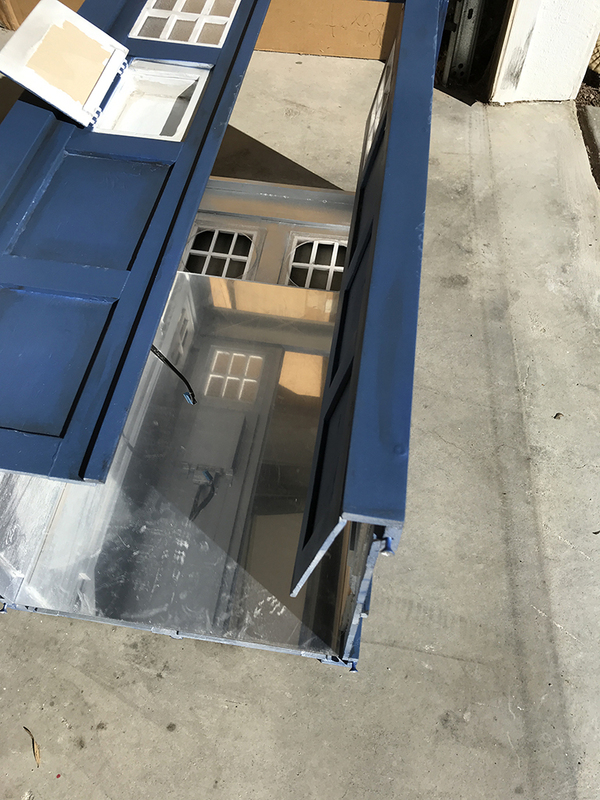 I left the masking on the insides of the windows since I planned to go over the whole thing with a clear flat coat to eliminate any differences in sheen. 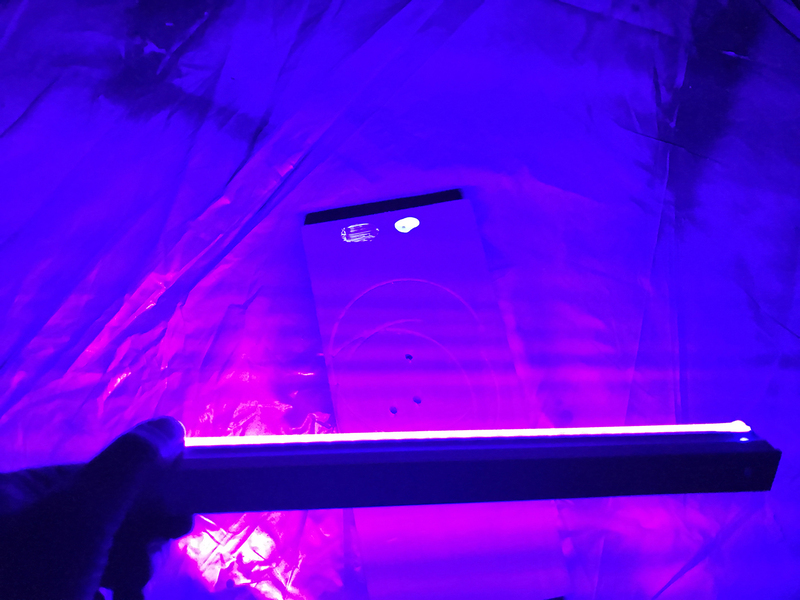 Remember that thing I said about UV paint in an earlier post? After a little trial and error, I mostly got what I was going for. 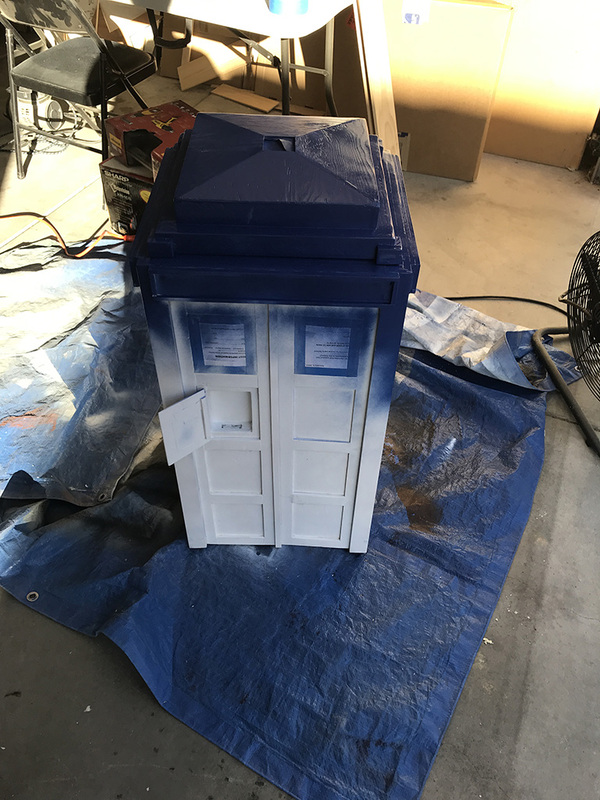 I tried airbrushing the paint on which unfortunately didn't work well. 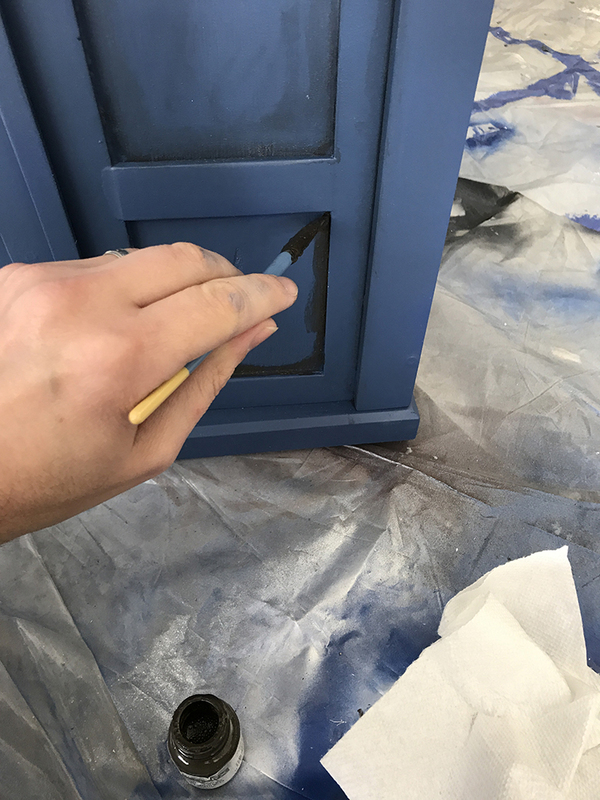 I needed to use the fine airbrush head (as opposed to the medium one) but it didn't spray the paint very well even though I'd thinned it out. Only thing I can think of is the paint particles were too big and clogged the brush or the line. So I ended up brush painting over the airbrush work. 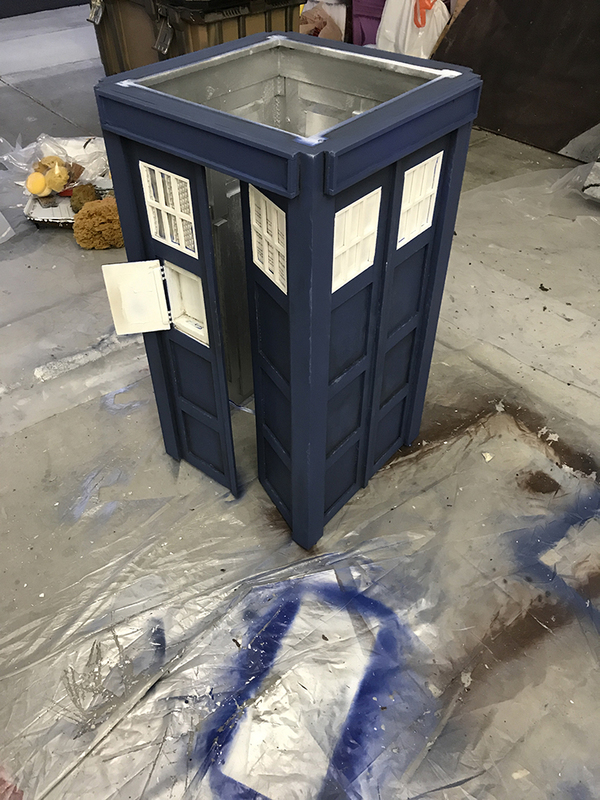 After it dried, the sheen from the transparent UV paint was still visible so I did a little more weathering over it, then hit the whole thing with the clear flat coat last night. And voila! This morning, what I painted is 99.9% invisible in natural light. If you know where to look, and you look at an angle almost parallel to the wall, you can still see it. Slightly. But otherwise it's invisible. And I'm happy. Oh wait Those of you who are fans of the show will know this reference... It was one of those late-night ideas that crossed my mind and once it did, I couldn't not do it. In person it doesn't look quite that messy - the phone camera can't 'see' quite the variation in color as the human eye can in person. Lastly, this morning I started the process of gluing in the acrylic window panes I ordered last month. These particular ones have large holes in them for the radiator fans to blow air through. 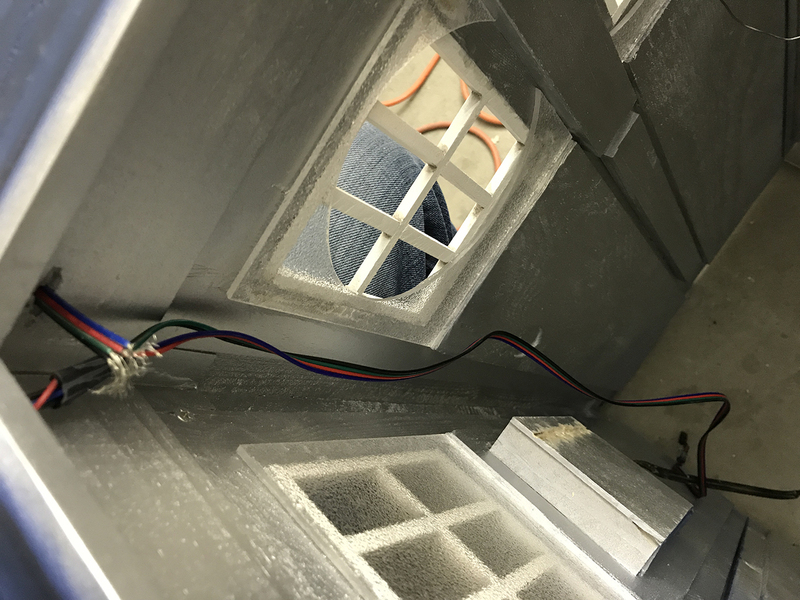 There will be two other fans, probably on the back windows because of cord length, whose windows will also have holes. 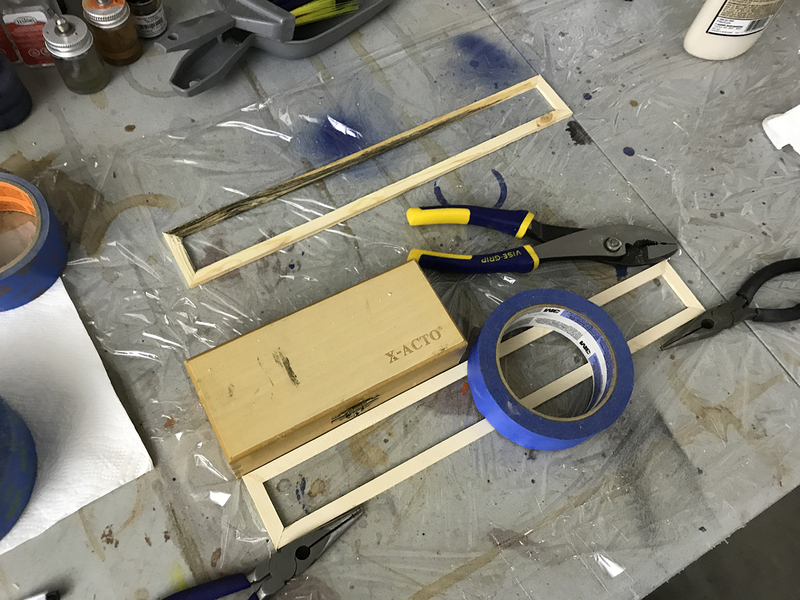 These boards are wedged it to help "clamp" the acrylic down while the glue dries. 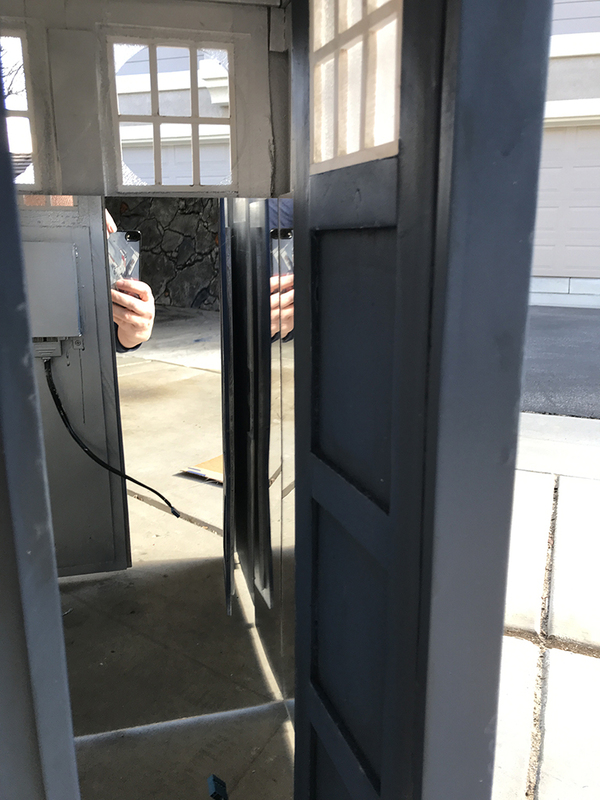 A few more progress pics - got the acrylic mirrors installed using a 3M spray adhesive (same can I used to glue the posterboard 'skin' onto my sandcrawler 10 years ago...finally used up the can this time). It's one of the relatively few adhesives that doesn't do anything to the mirror coating on the back of the acrylic, so I'm very glad I still had it. 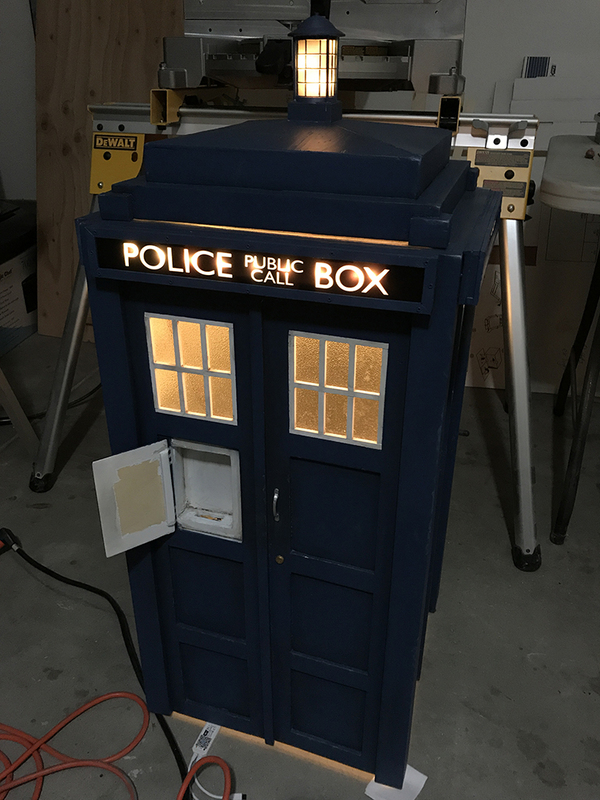 In these first couple photos, I left the Police Box sign interiors white to better bounce the LED light around. 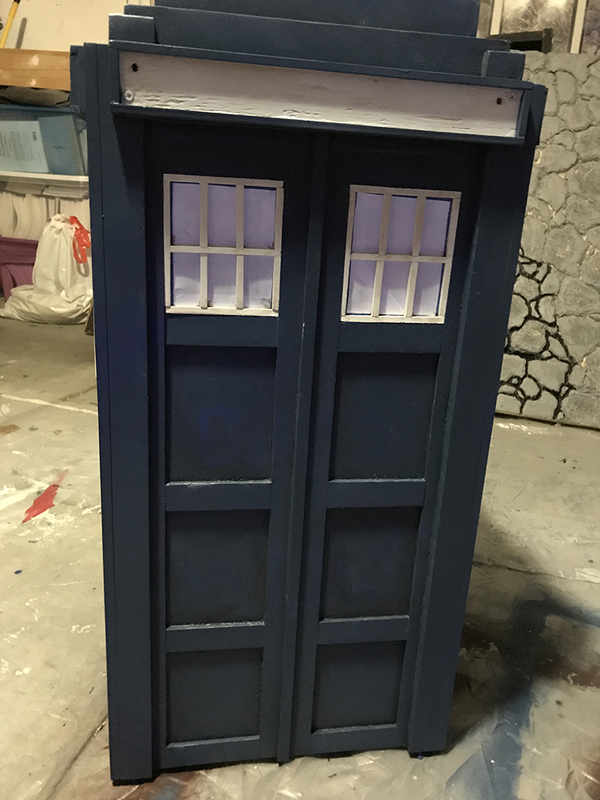 These will be fully covered with the transclucent black Police Box sign facings a local sign company made for me last month. 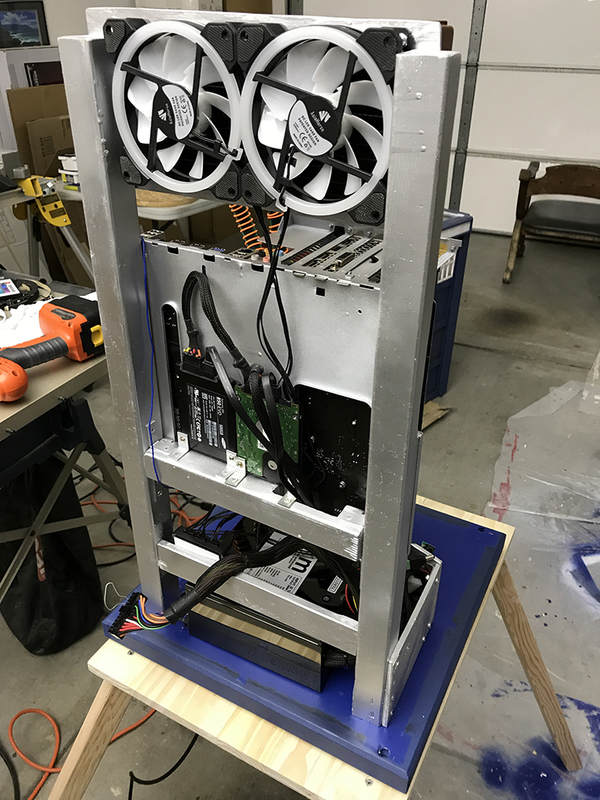 A couple days later, I did a test fit of the top over the computer components. I discovered that 1) yes, it fit. 2) BARELY. 3) I'd planned on putting fans in the back windows, but that wasn't going to work. One would fit, but the other would hit the radiator. And the cords, realistically, were too short to reach to where I'd have to mount the power hub for the fans, so I was forced to relocate them. 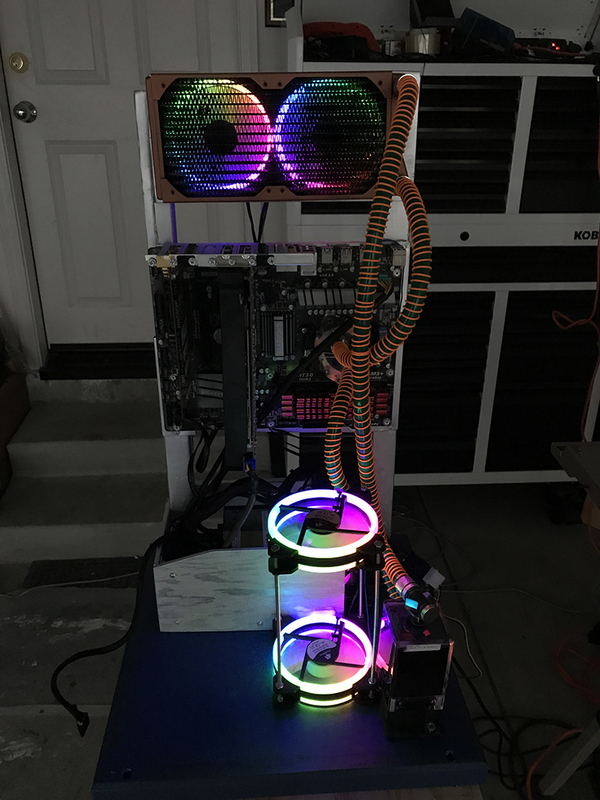 (I could have soldered in extensions on all 5 wires for each fan, but that would have looked messy at best and I really, really didn't want to). View looking down through the opening left by the removable roof. With the roof top on, you can't see the inside from this angle. 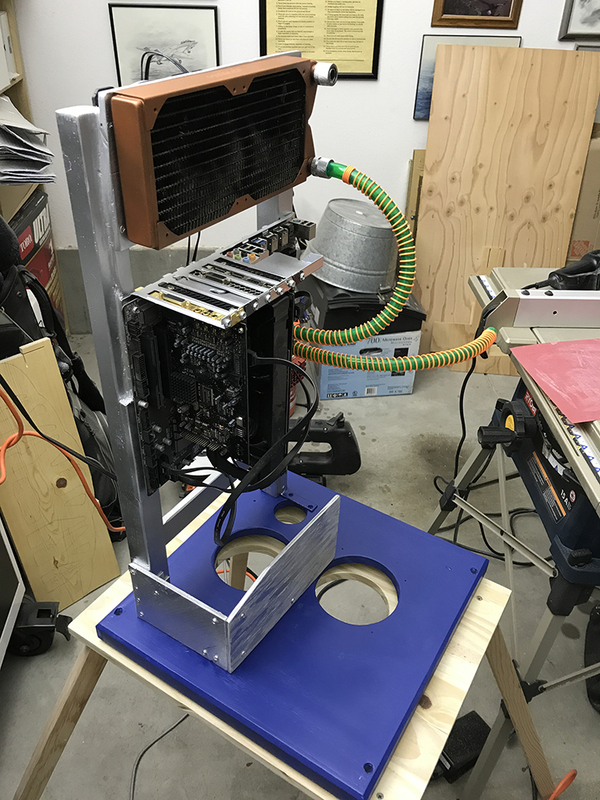 The radiator fans don't quite line up with the openings I cut, but it'll have to be close enough. As far as functionality goes, they'll work just as well as if they did line up. The inside with the roof on. 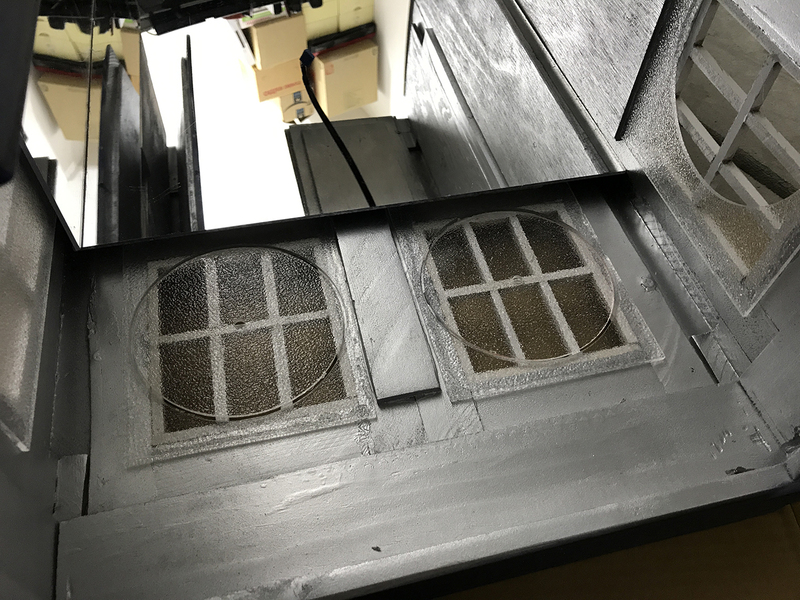 Since the fans weren't going to fit in the windows, and since I didn't want to leave gaping holes, *and* since I couldn't remove the existing window panes without damaging the case (superglued in and all), I put the circular cutouts back in. In this photo one of the cutouts is sitting there; when I glued it it, I made sure it was centered. And lastly, here's the computer pretty much reassembled. 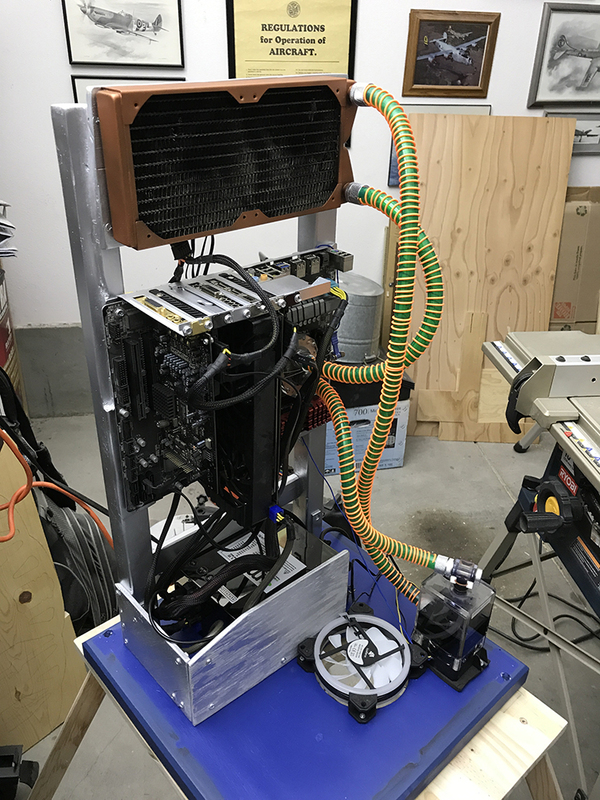 I used my air compressor to blow as much dust out of the radiator as I could, but there's still some clinging to those fins. 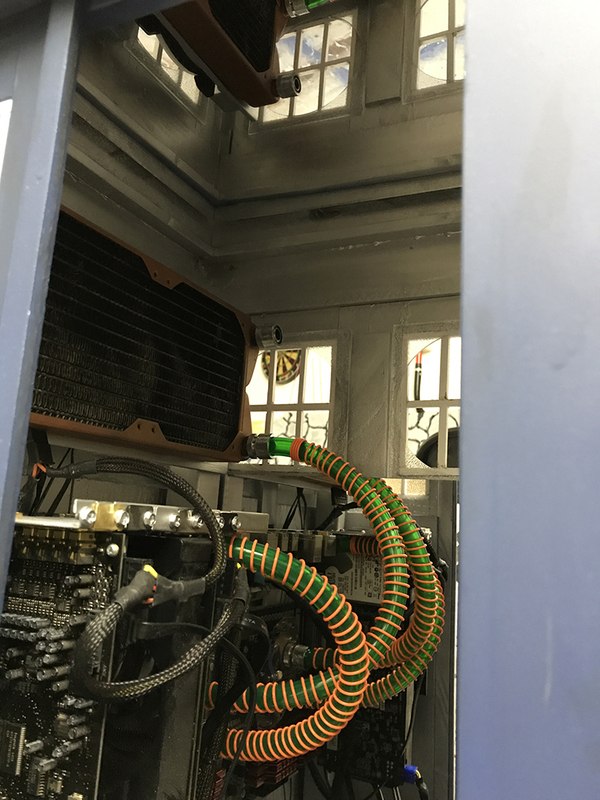 I still need to refill the lines with coolant and run the pump for awhile to distribute the coolant, eliminate air bubbles, and make sure there are no leaks. Some of the cables are not yet hooked up to anything, and I'd like to figure out better cable management. 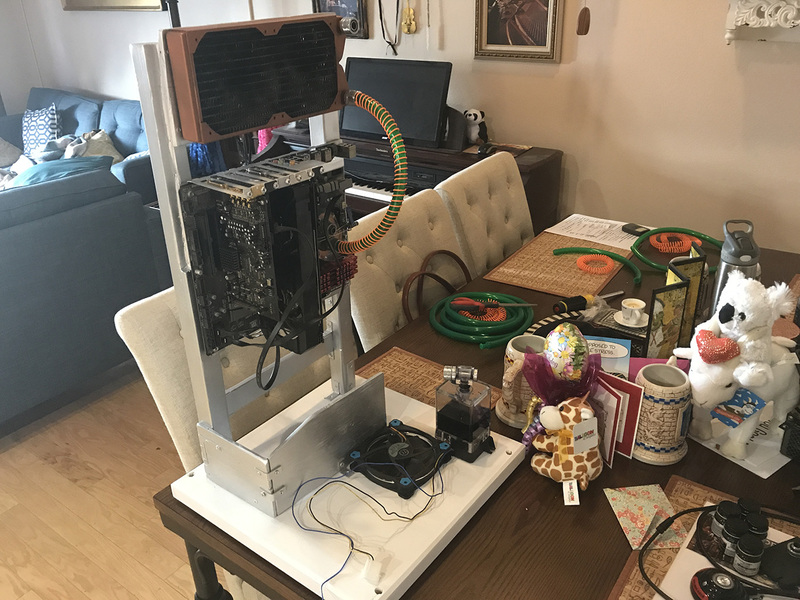 One problem is that many of them are too short to run up behind the motherboard, over the top of it, and down to the plug location. The SATA cables, if anything, are too long. I'm looking into replacing them with shorter ones, given that I've screwed the hard drives into a couple spare dust covers for the rear slots and the cables don't have far to go from the MB plugs to where the HDs are. To be fair, You weren't going to have good cable management with that setup anyway. 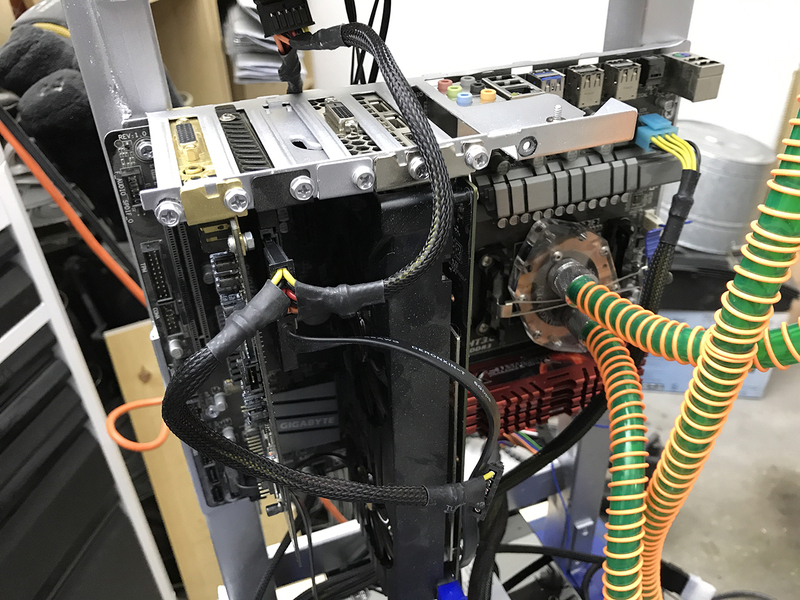 The I/O cables have to run through the bottom, right? 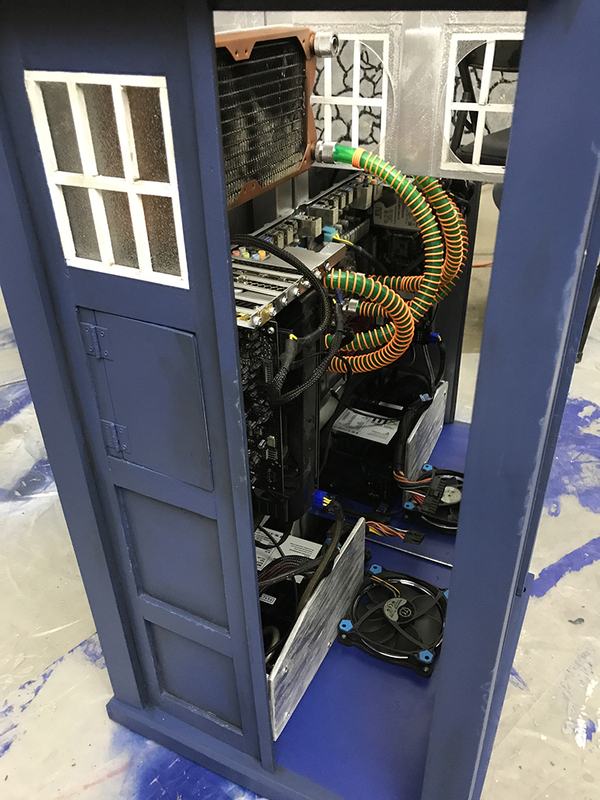 You might as well add more spiral wrap and go Orac3 on it. Yeah I suppose so. I did accomplish a little bit of cleanup - I moved the hard drives from the dust covers they were screwed onto, to behind the motherboard. Still same number of cables, but the bulk of the power and SATA cables for the two drives are now hidden behind the MB. 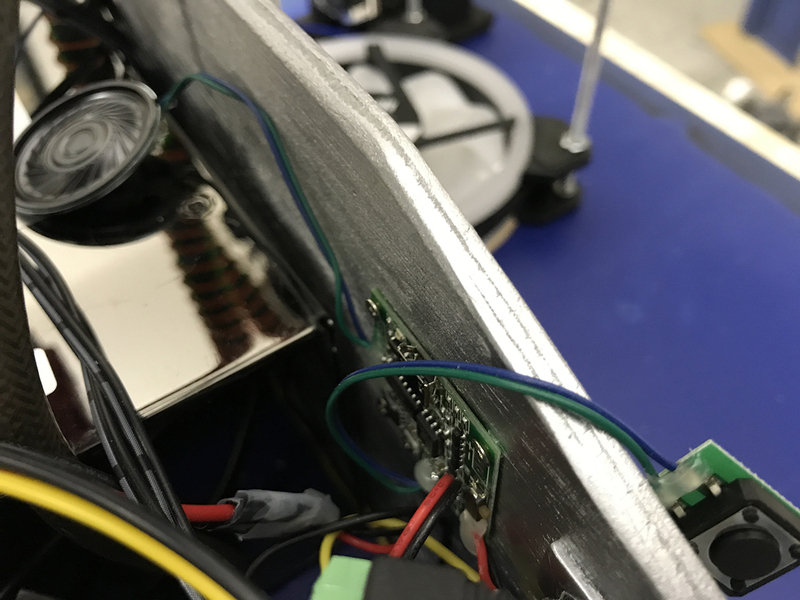 The rest of the cables are stuffed inside the silver enclosure. Not terribly elegant, but it works and they pretty much won't be visible. 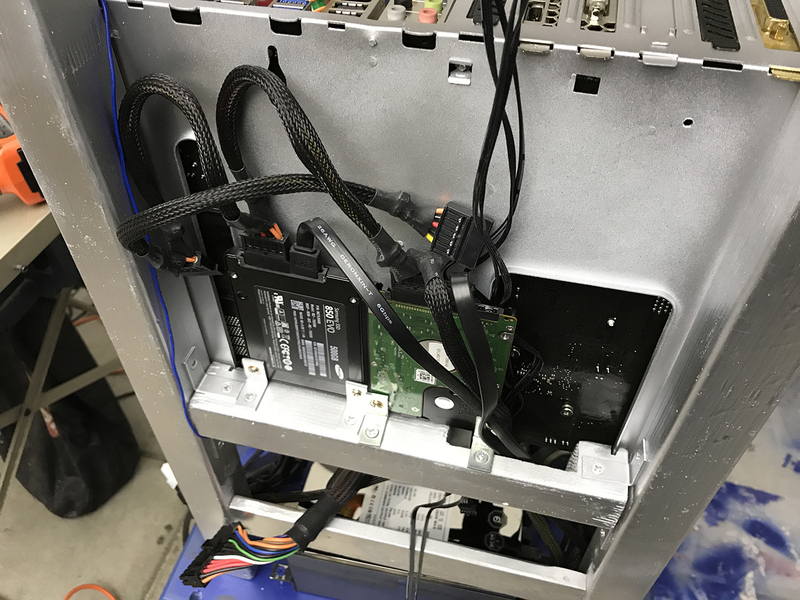 It bears mentioning that after I took this photo, I snipped off the extra SATA power connectors. It's been far more years than I care to think about since either my wife's system or mine had more than two drives in it. And after the move. That one CPU power cable is the only one I wish was longer - it's too short to run it up behind the MB and then back down. It's not one of the modular plugs in this PSU so I can't replace it, and I don't feel like soldering in extensions. 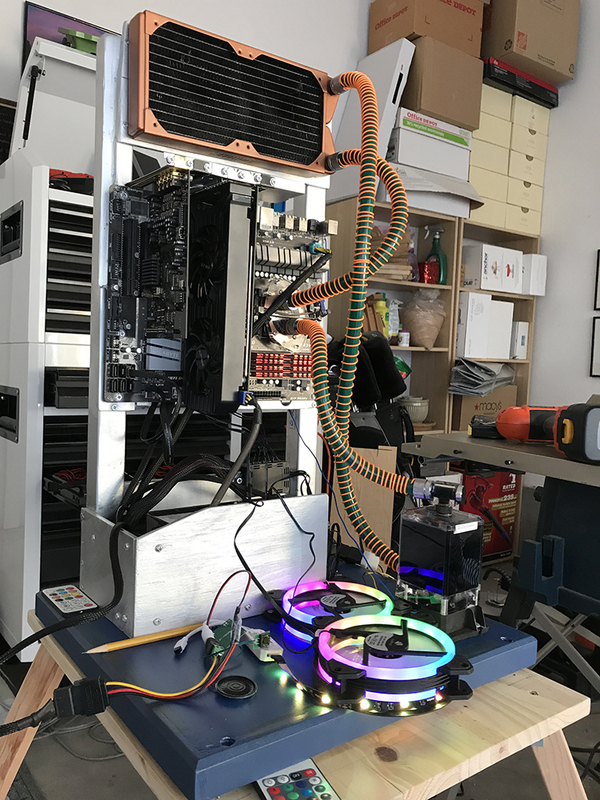 Yesterday I got the fans hooked up, got coolant back into the loop, ran the pump for a couple of hours, and got the audio chip installed and tested that (hopefully) will play when the system is powered on. I say "hopefully" because while it works perfectly fine being activated when it has power, I don't know if it'll activate if I splice it's activation button into the power switch for the computer. If the trigger is happening at exactly the same time as power is delivered, I could see it not working. I think the only thing for it is to give it a shot and see what happens. At the moment, it plays an audio file I mixed of the TARDIS takeoff sound, with the Dr. Who theme music fading in, and then the TARDIS landing sound coming in at the end. The little speaker wired to the audio chip likes to stick to the PSU casing, which is fine with me as it turns the PSU case into a larger speaker and it's much louder than I'd hoped to get. I also got the LED lights hooked up to test them and make sure everything was wired up correctly. 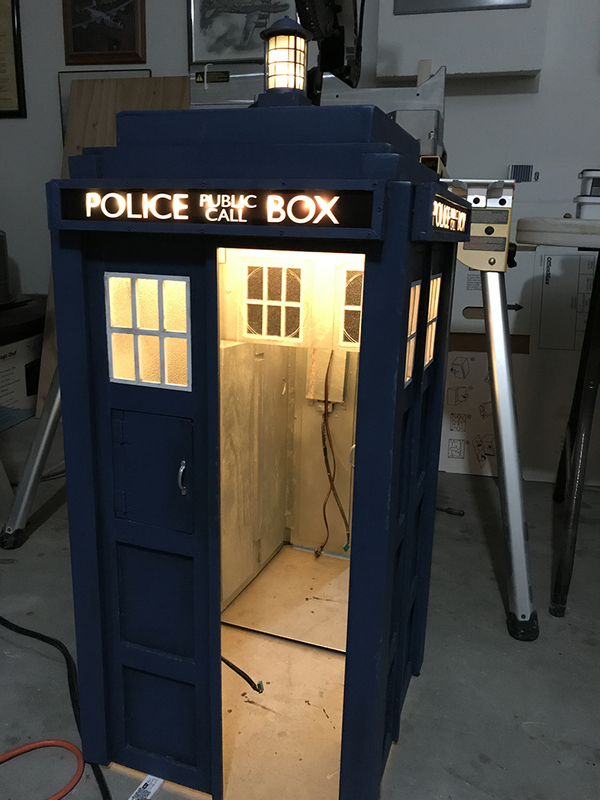 I have yet to wire the lights to the interior of the top of the case. This is the audio chip, screwed in using TINY screws inside the silver enclosure where it's nice and hidden. I mounted it with its USB port facing up for easy access in case we ever need to do anything with the MP3 file on it. And there's a little super tiny power switch on the board so it can be turned off. Currently when activated it plays the MP3 file once. 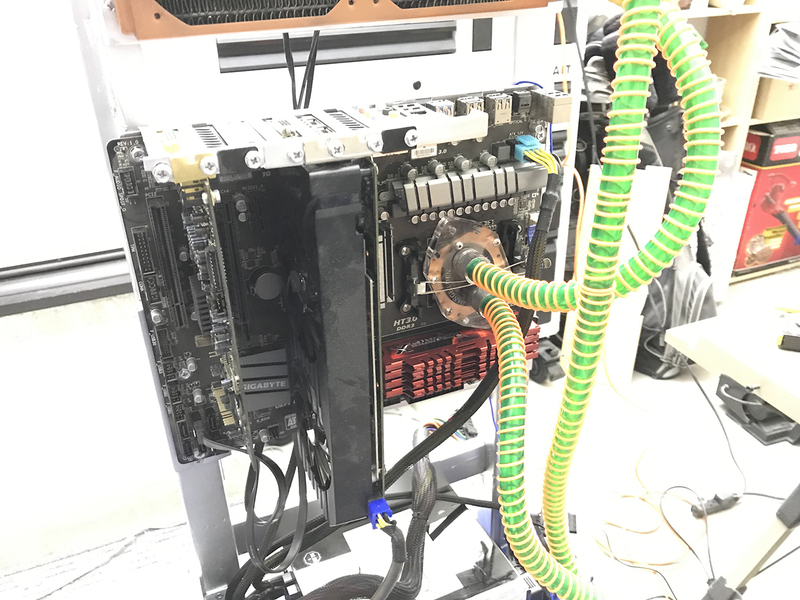 I couldn't put the case fans where I'd wanted them to go, so I got a screw rod and a bunch of nuts and mounted one fan above the other. Not really necessary of course, but I thought it'd look cool. 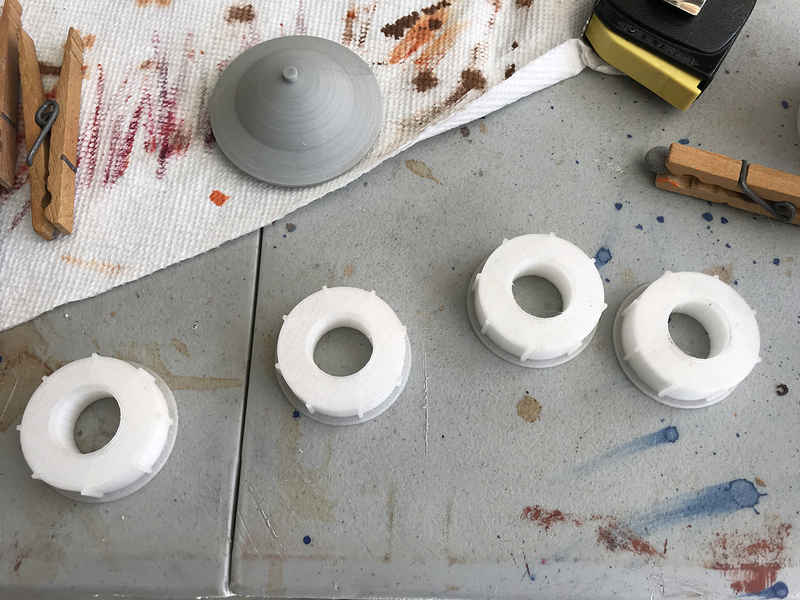 Today the 3D printed parts arrived. 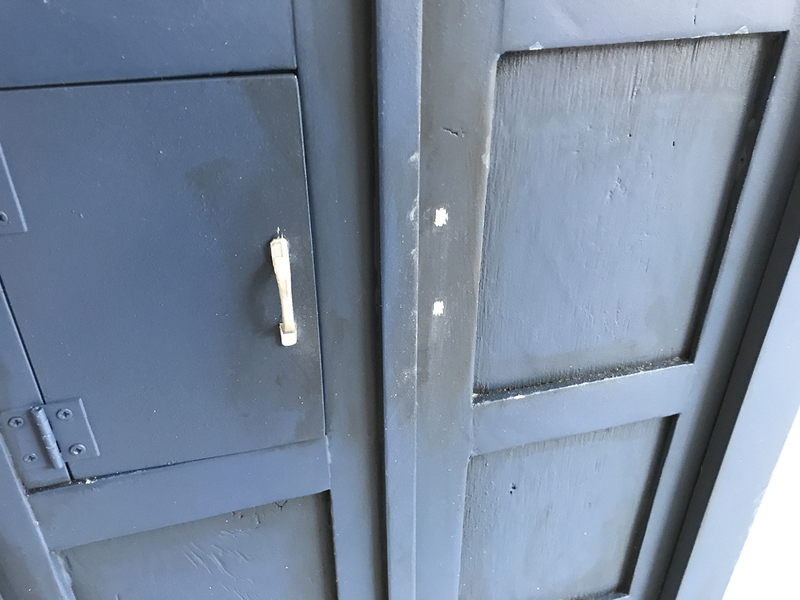 The two door handles, the door lock, and the lamp on the roof. 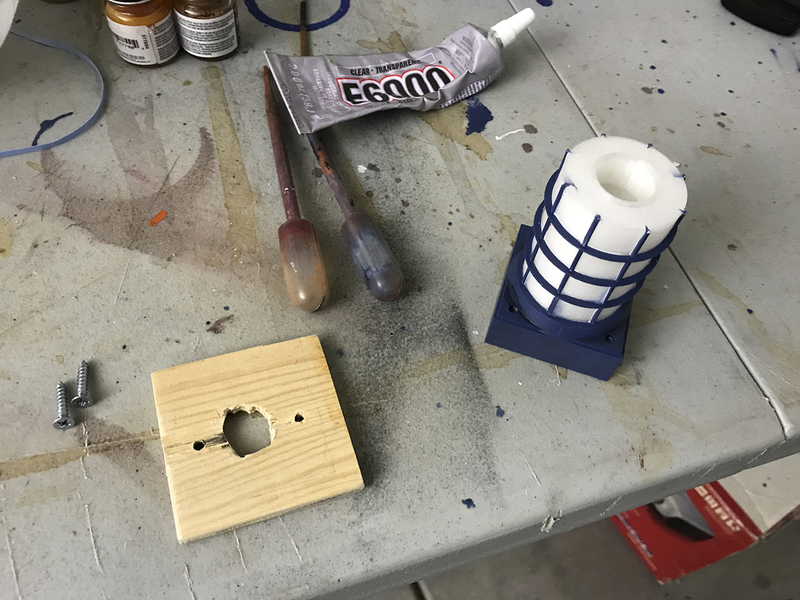 The door lock didn't turn out great (it was just too small), but the other pieces turned out fantastic. I got the parts painted and installed today. Took awhile to think of how to attach the lamp to the roof. 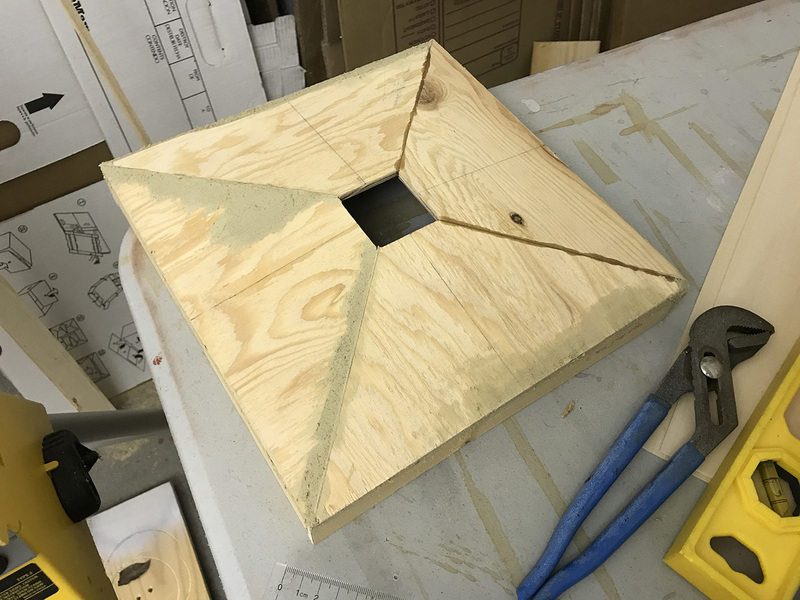 I had intended for it to sit on a horizontal support piece which would be glued inside the roof. 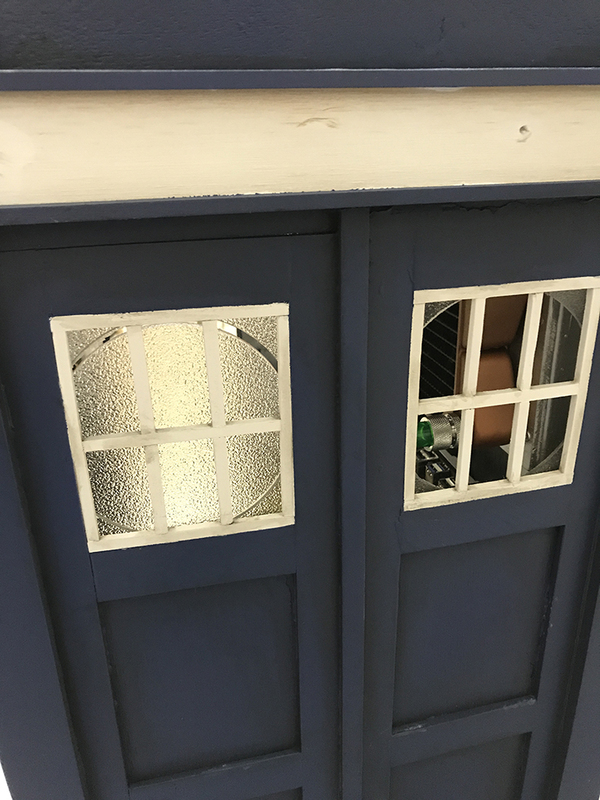 Problem was, the opening in the roof isn't *quite* square, and the lamp base turned out to be ever so slightly bigger than the opening. 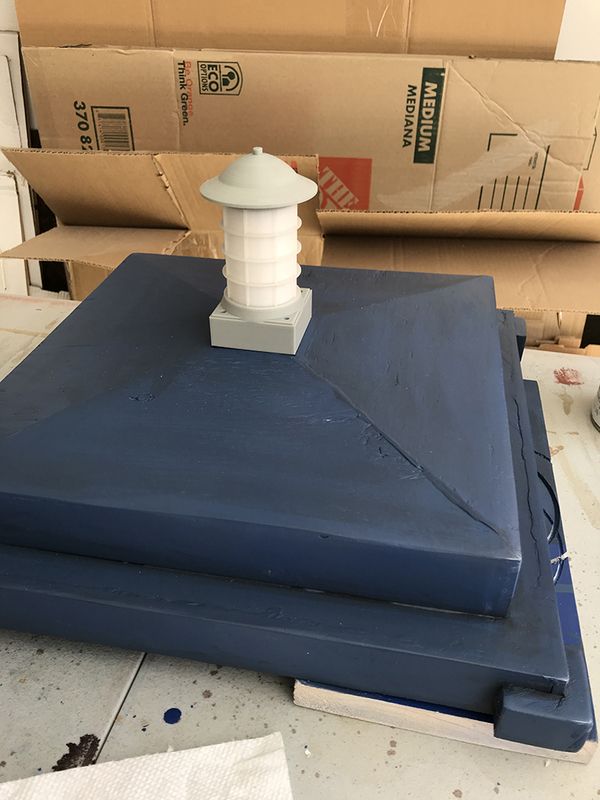 What I eventually ended up doing was making that support piece, cutting a very messy hole for through which to insert a dowel wrapped with LEDs (but no worry, it'll be 100% hidden), and then running a couple of screws through the wood and into the lamp base. It's bolted in very securely, and I didn't have to glue it down. All that velcro is where an acrylic mirror attaches that pretty much covers this whole area. I'm not bothering to paint this piece of wood since it won't be visible at all. 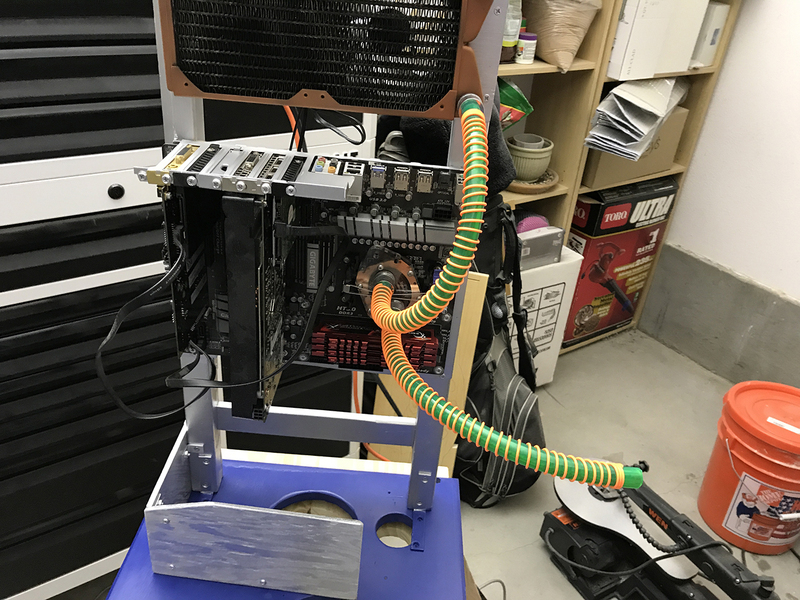 -I only just noticed your mounting solution for the CPU block, though... There's gotta be a better way. Oh there is . I just never felt like it was worthwhile to buy a new waterblock. This solution has worked just fine for many years now. I think this waterblock was from several systems ago using an older AMD chipset. The block itself still fully covers the CPU, and despite appearances, that metal clip holds it on there very tightly. Enough that to remove it I have to first loosen the screws holding the plastic clips onto the motherboard. 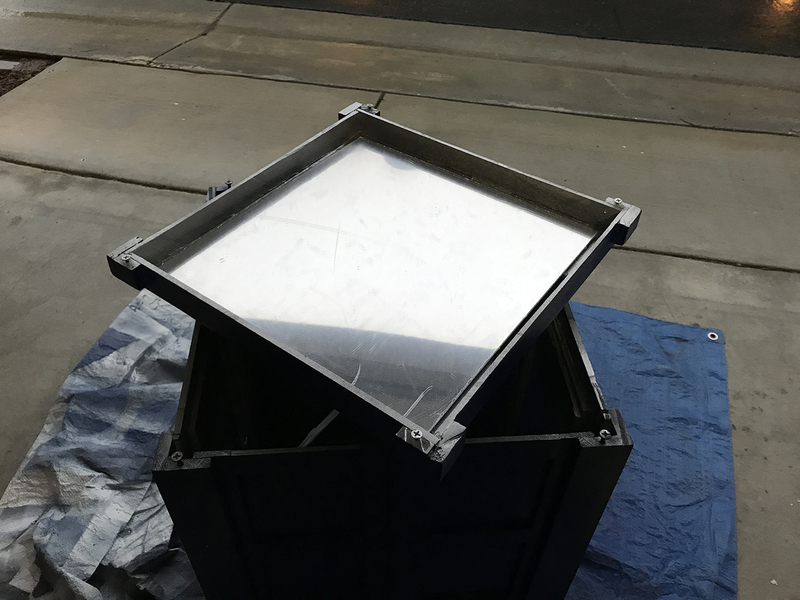 If the look bothers you, you could make a new one out of 1/4" plexiglas that sits on top of the old cover. -holes for the fittings to pass through, hardware store springs, etc. Not a bad idea. It's funny, I've gotten so used to it I don't really see it anymore. 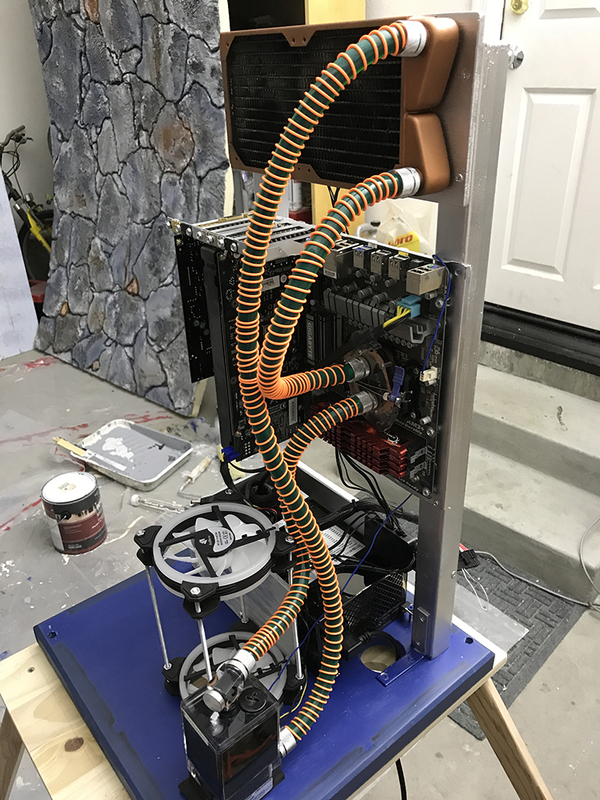 I might make that change in the future - at this point I'd have to drain or partially drain the loop so I could detach the tubing and fittings to put a fabricated piece of plexi on there. Definitely have no desire to do so at the moment, having just gotten it all back together. But I'll keep it in mind the next time I decide to tinker with it, because that will definitely happen at some point. One of my strong desires is to put a 2TB PCI-E SSD in there...a little bit for the speed, a little bit for the slightly increased capacity beyond the current 1TB HD and 0.5TB SSD I have now...but mainly to clear up the power and SATA wires. And to have one internal drive instead of two. I'm just waiting for them to cost less than $350 for a 2TB drive. The problem with drives is that as soon as you buy one, they go on sale for half of what you paid. Looking great and I'm not even a who fan. Been a busy-ish Saturday today. First off, photos from the last few days. I've had a spot of...difficulty...with the police box signs. Better planning with the sign box design (rather than blindly following someone else's design which was for a life size model) could have avoided the issue. 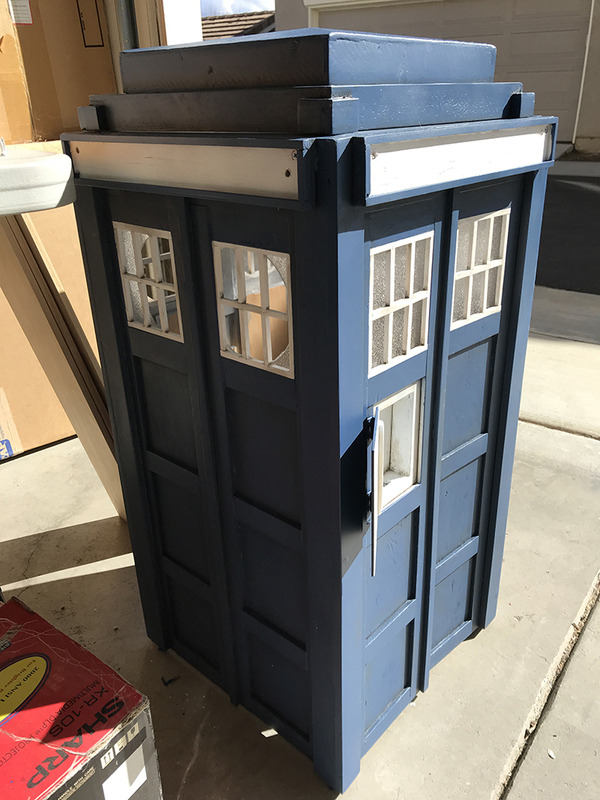 Namely, that issue was that I didn't have an easy way to secure the police box signs within the box. I added some bits of wood in the corners, intending to screw the signs in in multiple places. While that worked physically, aesthetically it really, really didn't. Despite holding the signs as taut as possible while screwing them in, they still moved slightly and ended up bowing in or out, with lots of light leakage around the edges. 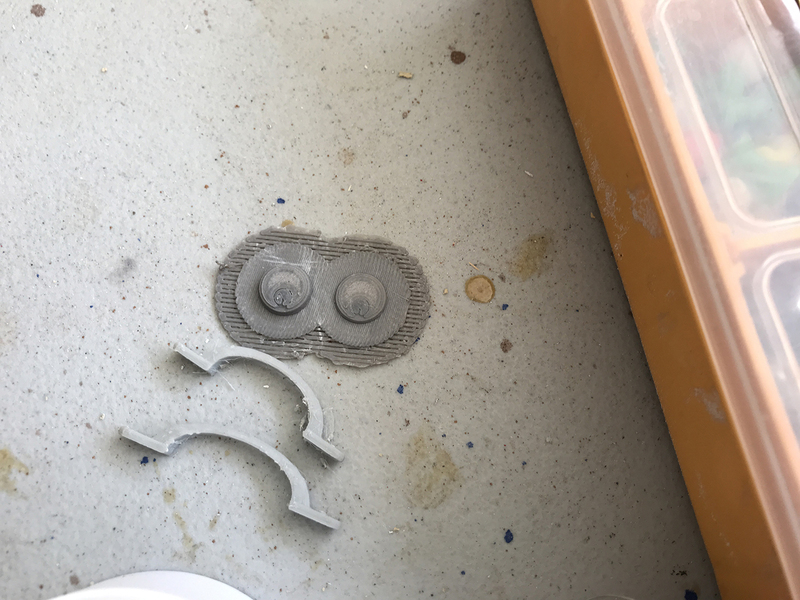 That was unacceptable, and I didn't want to glue them in (and even then they would still likely have had some light leakage). What should I have done? 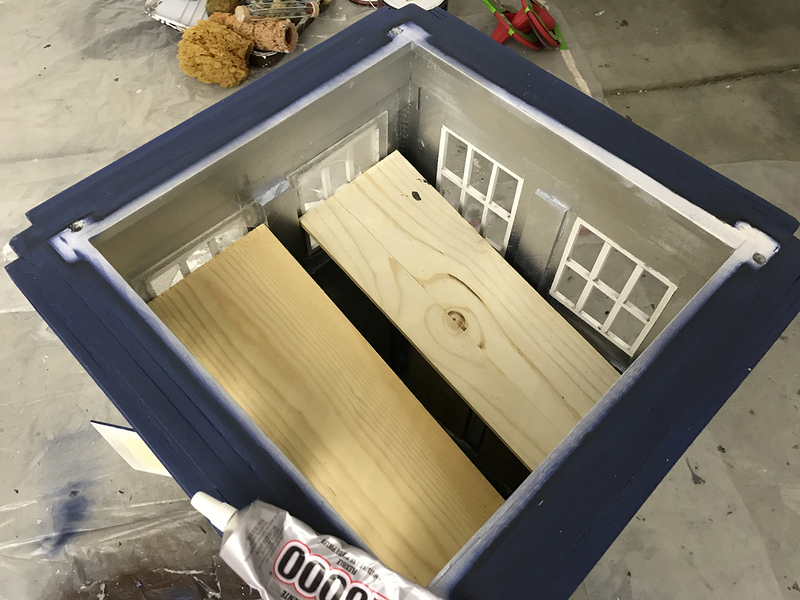 I should have made the interiors of the boxes more recessed, and made a slot in the top at the front and corresponding grooves down the sides and across the bottom, so the plastic sign could literally be dropped through the slot in the top, mailbox-style. It's how real signs are often made, I don't know why it didn't occur to me. What I ended up doing, you'll see below. 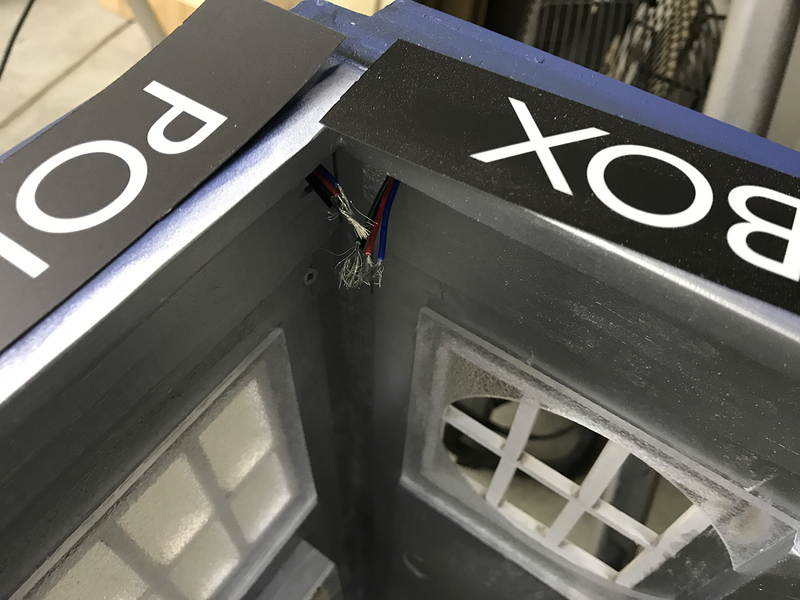 I think it'll fix the issue, allow me to mount the signs cleanly, and won't be too much of an inaccuracy in design for anyone to notice. After getting that in, it was finally time to start the dreaded wiring. The wires on these female-female connectors seemed a LOT longer before I cut them. 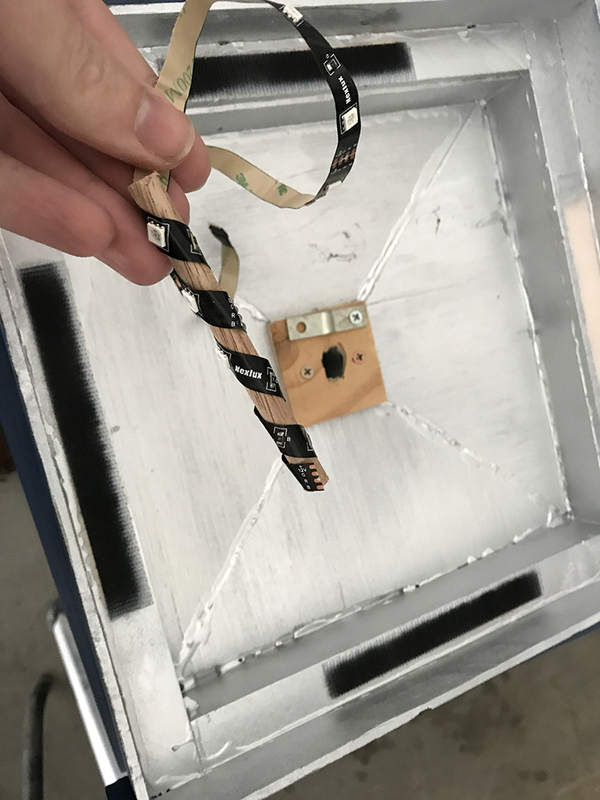 As you can see, the holes through which the wires feed are too small for the connectors to fit, so I had to snip them, strip the ends of the four wires in each bundle, feed them through the holes, then resolder them. The resoldering was rather challenging - I had very little room in which to work. 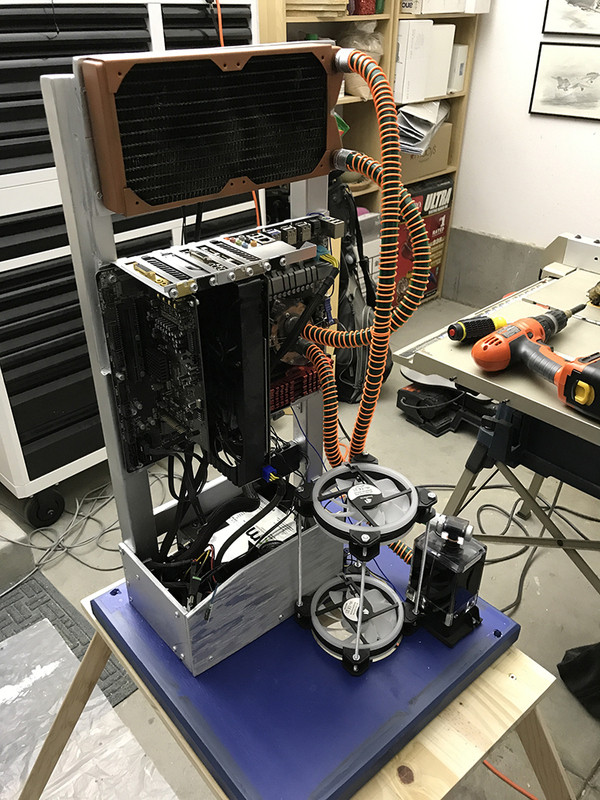 I had a fan set up to blow the solder smoke away from me, and I think in the end it took an hour or two to do all the wiring. It's not perfect - add this to the "should've done it another way" list. 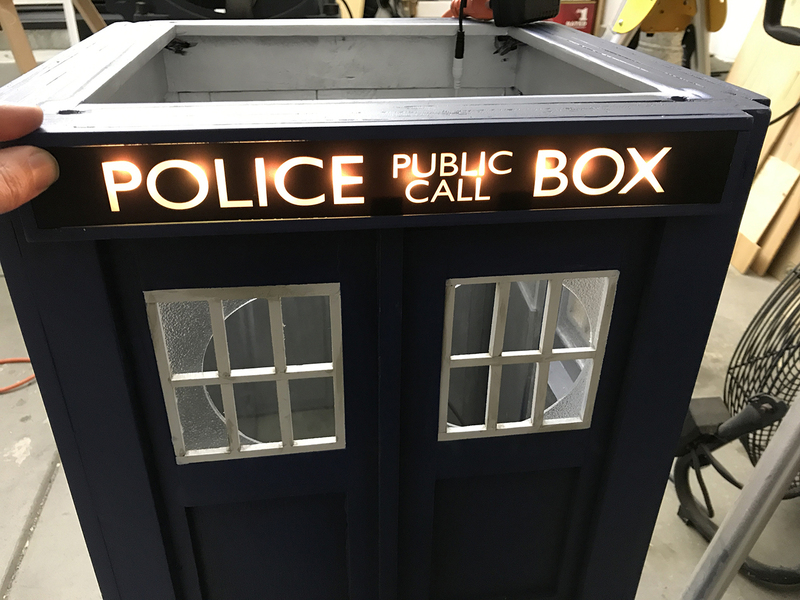 Had I made the sign boxes more recessed, there would have been room to run the LED strips around the edges rather than across the middle. It would have resulted in more even lighting of the sign. Didn't think of it until it was far too late, until I would have had to remake the entire model. 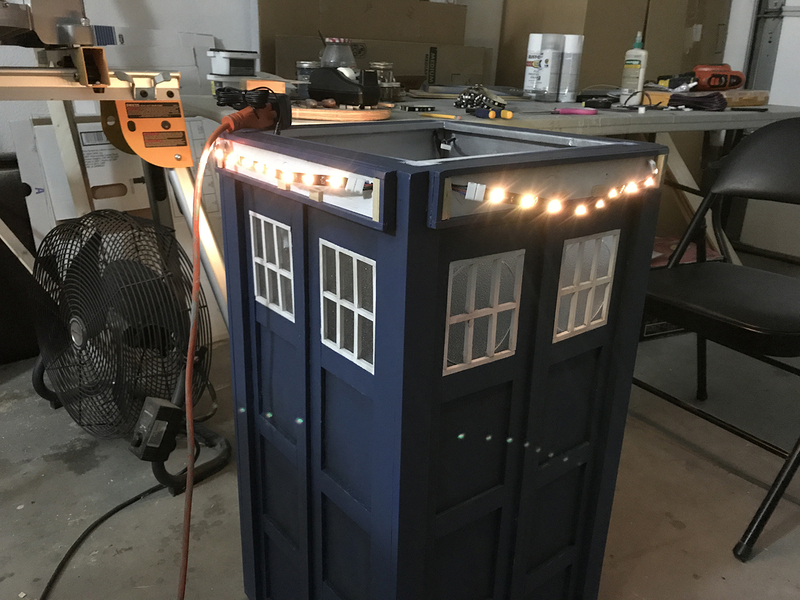 I then ran the strip twice around the interior perimeter near the top, and then ran a connector wire to one more series of LED strip segments, which I stuffed into the lamp. 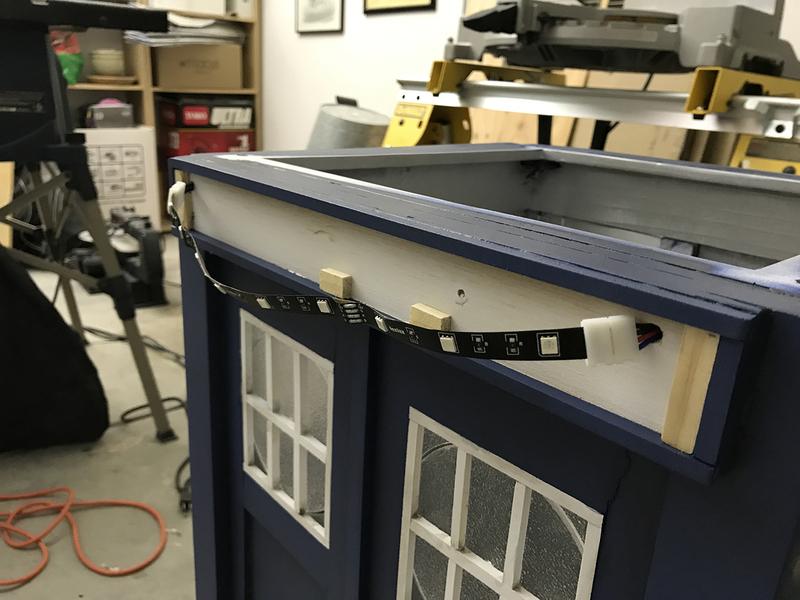 I'd initially intended to put a dowel in there with the LED strip wrapped around it. 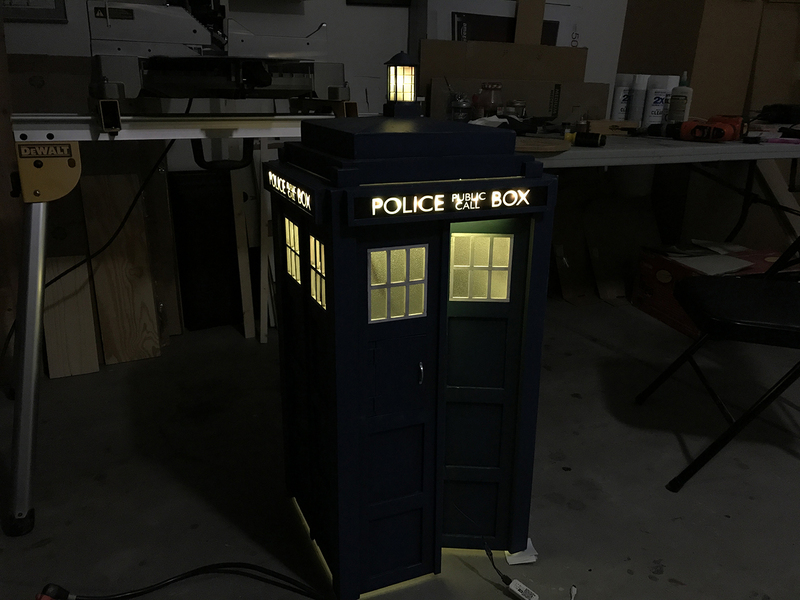 I got impatient and wanted to see what it looked like lit up, and sorta fed the strip into the lamp interior and stuffed in as much as would fit. My wife told me she likes how it looks, and this is her system, so I said okeedokee, that's done then. 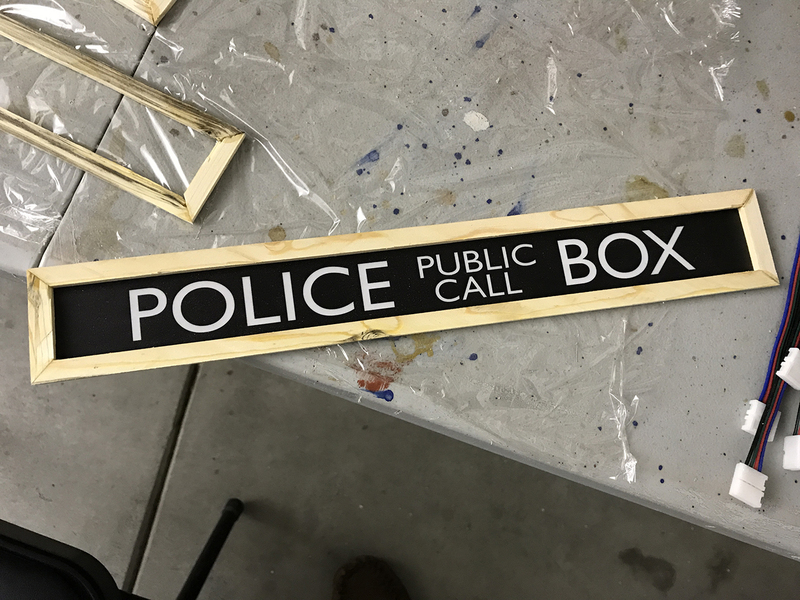 Now for how I'm fixing the sign boxes so they can properly hold the Police Box signs. I fabricated front frames, with each piece mitered at 45 deg. 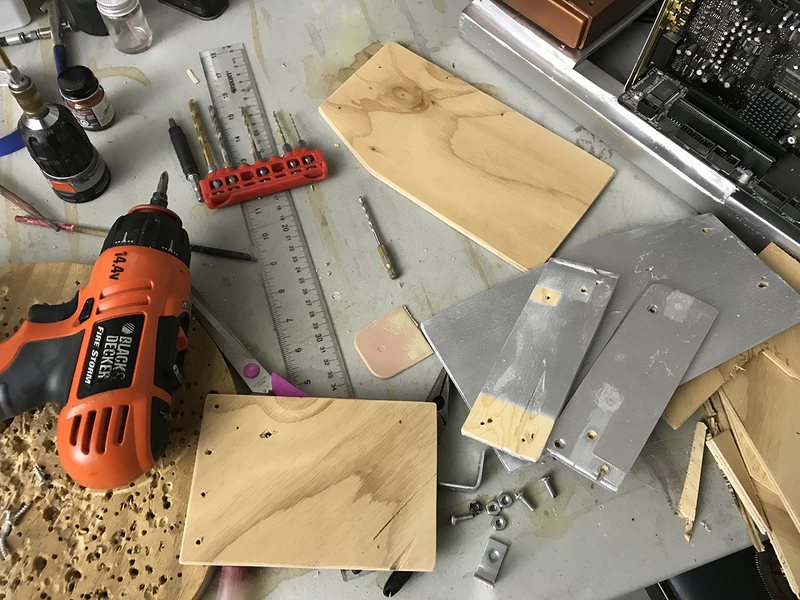 I took some leftover furring strip pieces and used the table saw to shave down their thickness to around a quarter inch....maybe less. Honestly I forgot already. 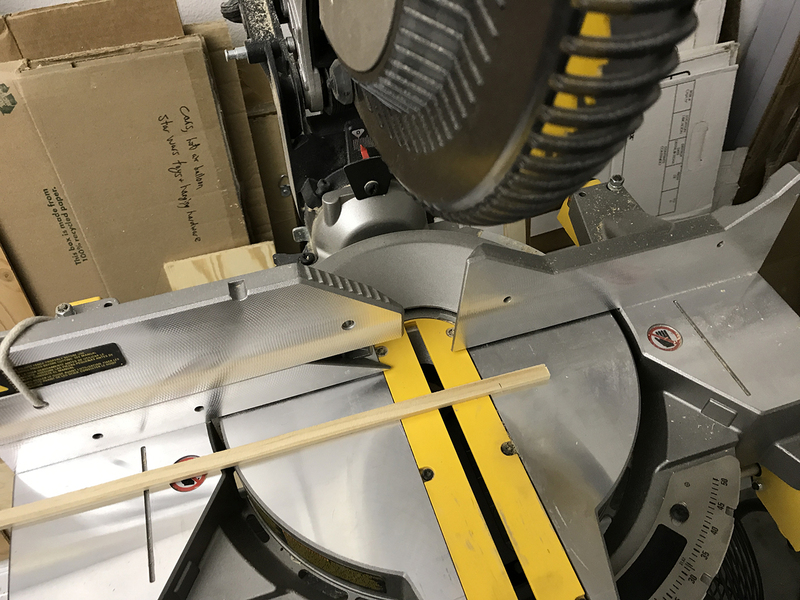 I then ripped those thinner pieces down to 3/8" wide, then set the chop saw miter at 45 and measured and cut eight 14" long pieces and eight 2" long pieces. 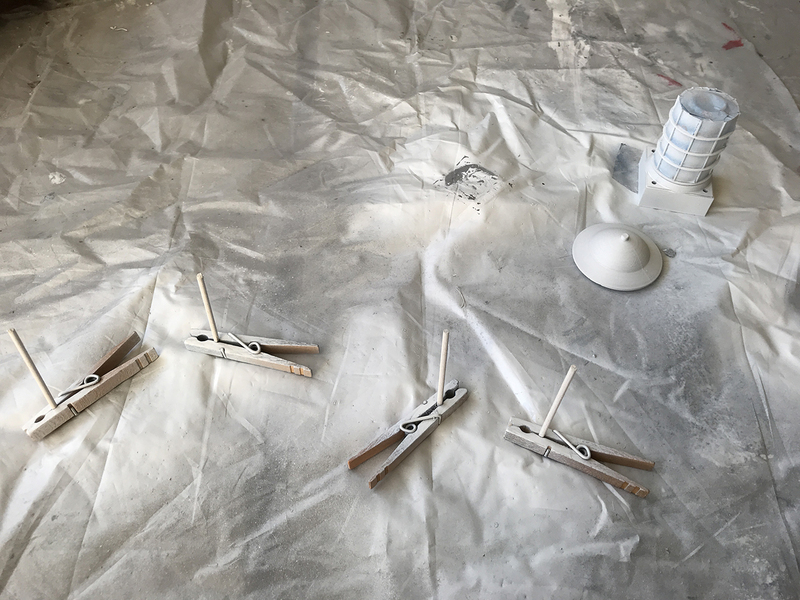 I got them glued together, then put 12 screw holes in each (seems excessive but I wanted to avoid the wood bowing out), screwed them down to some scrap wood so they wouldn't scoot while I painted them, and got the primer coat on. 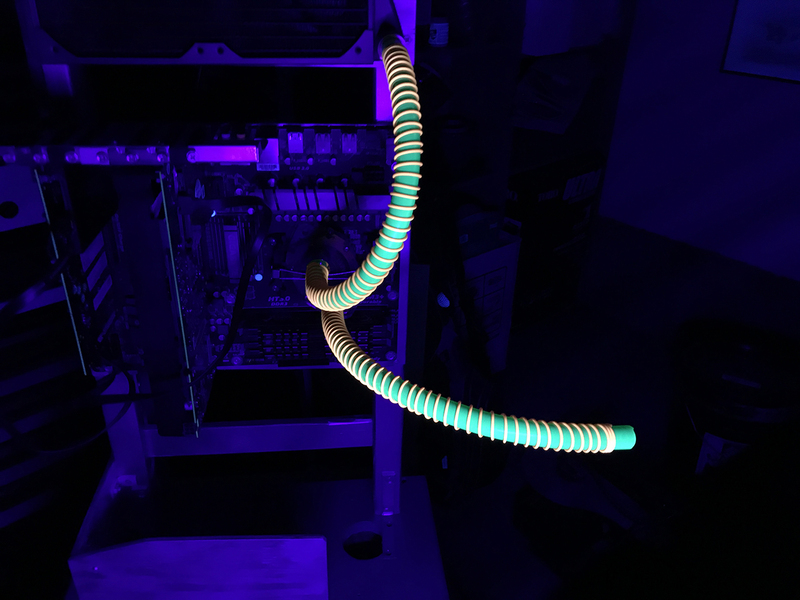 And now some gratuitous shots showing that the LEDs can change color... The receiver for the remote also functions as a wifi receiver so the mfg. app for the lights can sequence them to music and do all sorts of stuff the remote can't do. 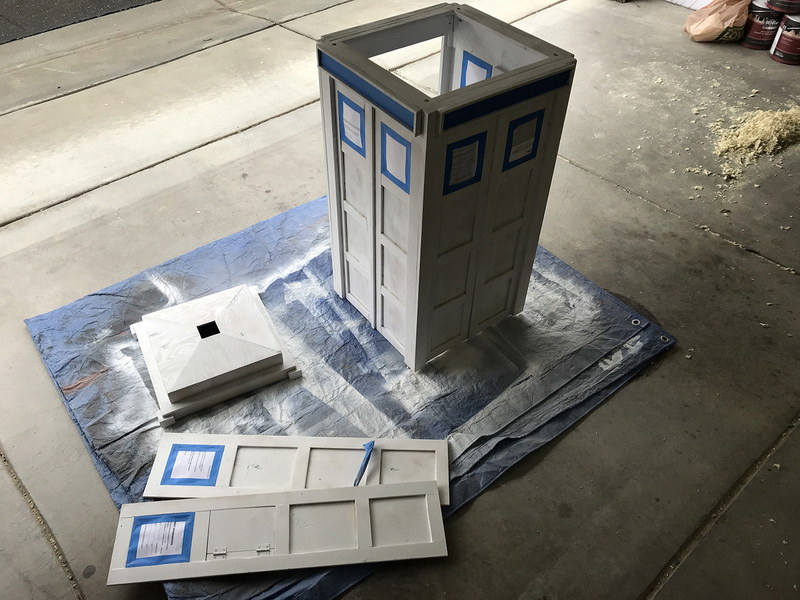 With this post, the TARDIS itself is pretty much done. 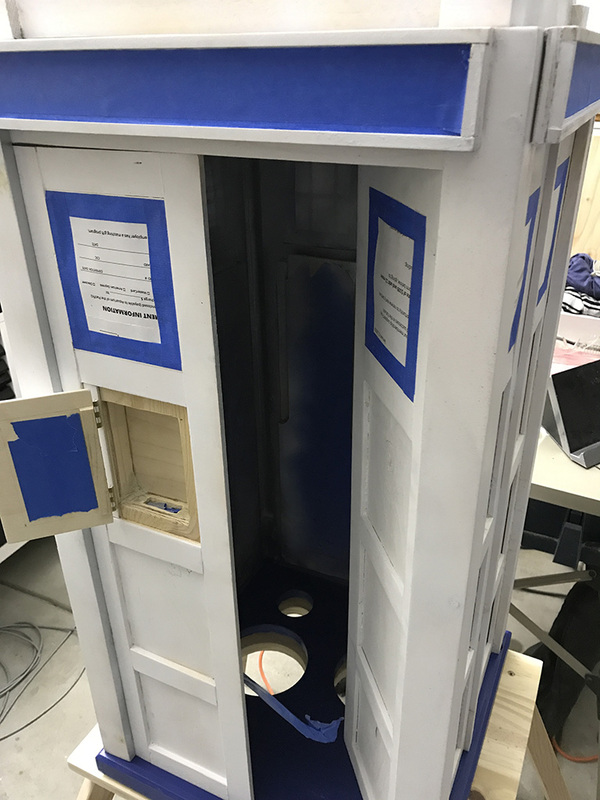 I still need to make the phone that'll go inside the panel door, I still need to do the signs that go on the front, and there's a couple minor cosmetic things I'll fix when I have more energy. 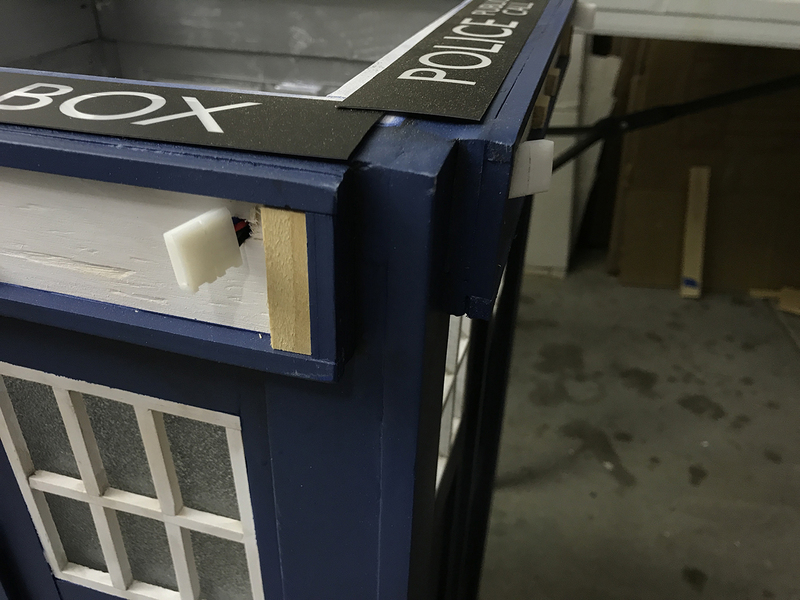 For instance, I left the roof removable so there's some light leakage in the seam above the Police Box signs. 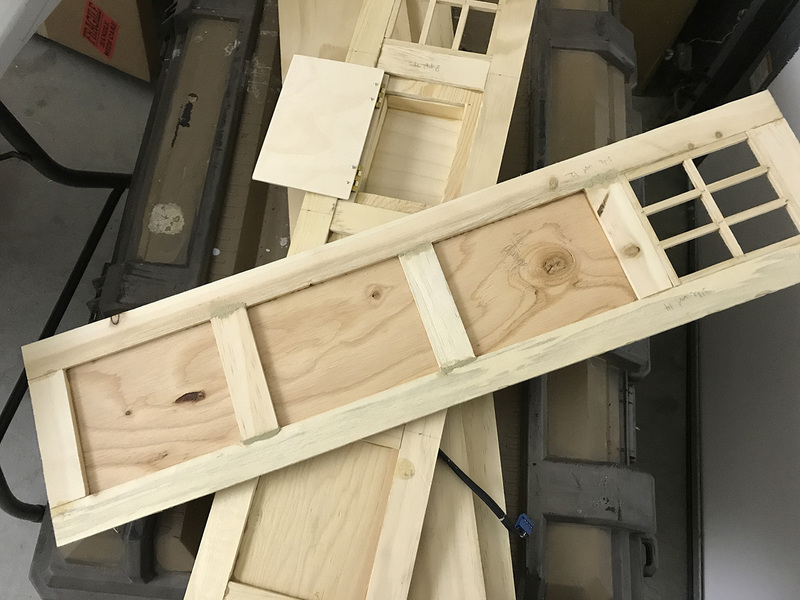 I should be able to fix that by putting in a fence around the interior of the top opening, a fence that would rise vertically by maybe 1/4" or 1/2" above the first level of the roof. That should prevent light from being visible through the seam. I've got enough scrap wood to make it, be a good use for it. 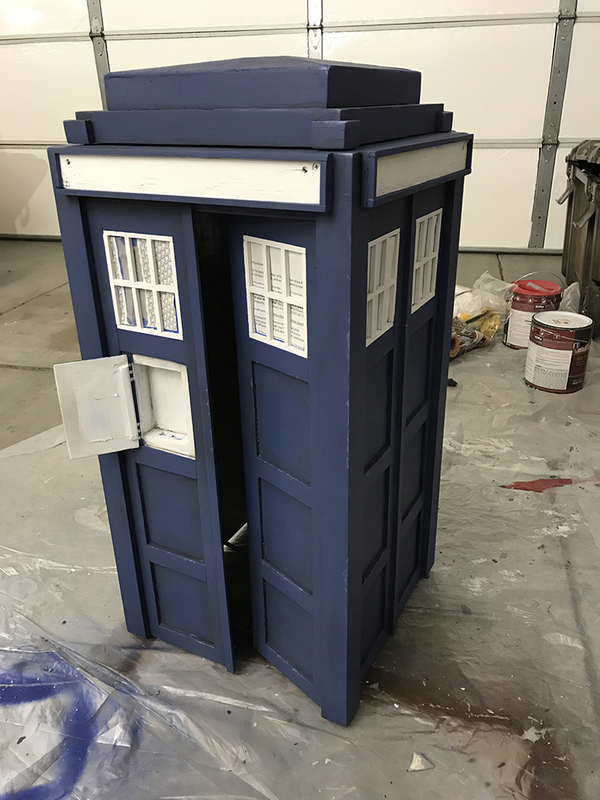 Other than those minor things, the TARDIS itself is done. The table is a different story. I want it to have the Dr. Who and BBC logos on it, probably lit up like the Police Box signs are, and it needs to have a "drawer" of sorts on the right side so the UV light can be pulled out and illuminate the side of the TARDIS with Bad Wolf painted on it in UV paint. Another goal is to incorporate cobble stones on the table top. 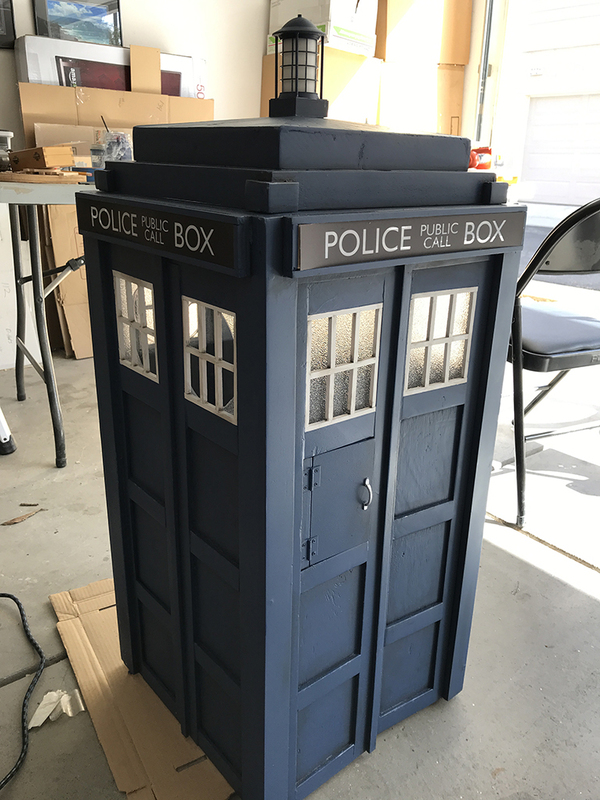 My wife's been doing some set building work for a couple productions and has become really good at carving and painting foam so it looks like rock. 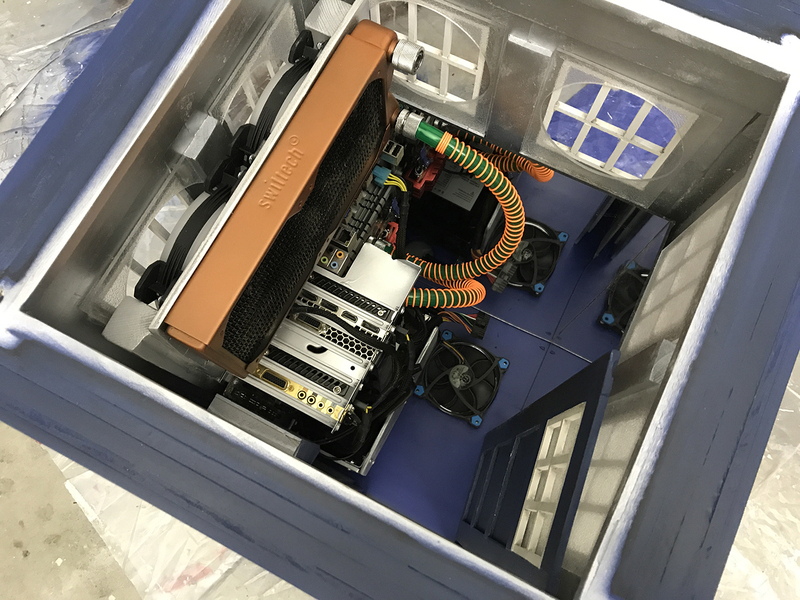 Be fun to have her contribute to this (it *is* her computer, after all) and I think the TARDIS would look awesome sitting on some London cobblestones. 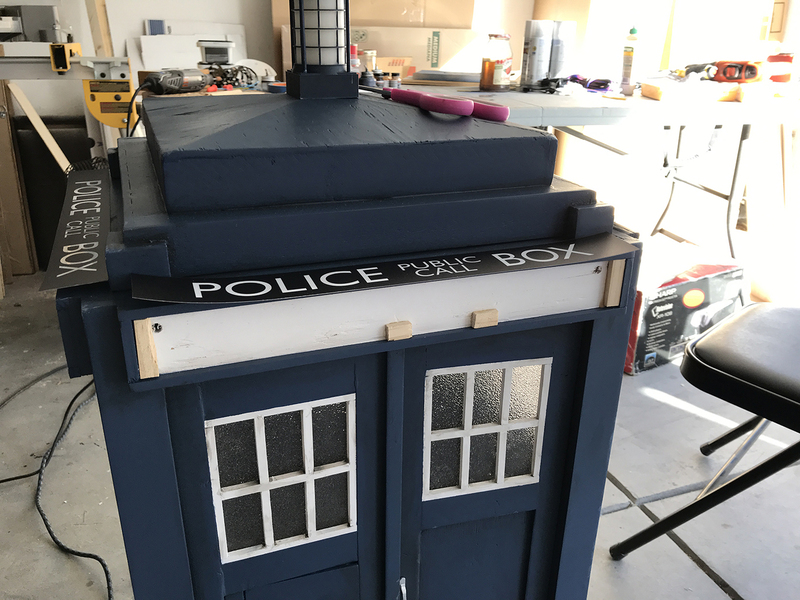 A few photos from today - I airbrushed the Police Box sign frames, drilled 12 holes in each of them, carefully held them up against the sign box and drilled a couple of pilot holes, used a screwdriver to put in a couple of screws to hold it in place, drilled the rest of the holes, pulled it off the sign box, added the Police Box sign, put it back on, and then put in all 12 screws. The third time around...the 1/16" drill bit broke. 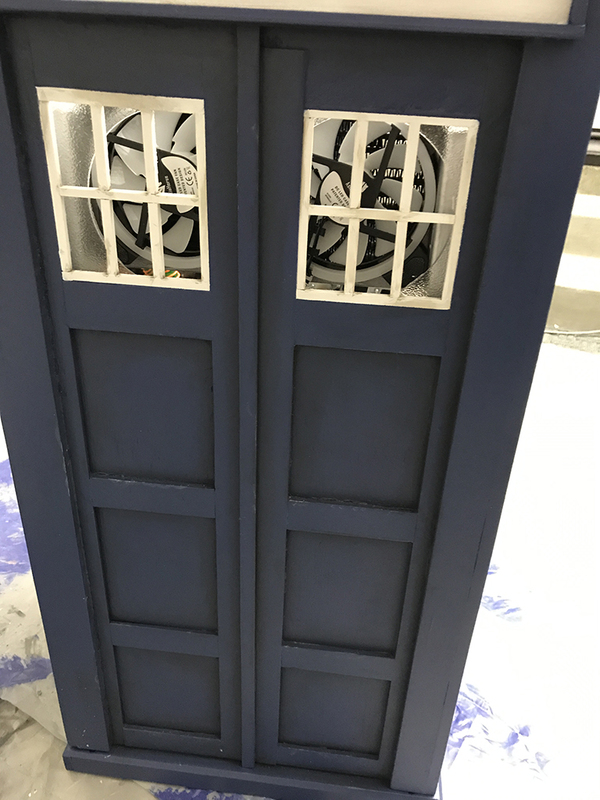 I'm very glad I had similar sized but much shorter screws, one of which I put in to fill in the screwhole and keep it symmetrical in appearance with the rest of the front facing. The rest of the facing would have looked odd if I'd only used wood filler and painted over the hole. After a quick trip to the hardware store, I got the last sign on there. 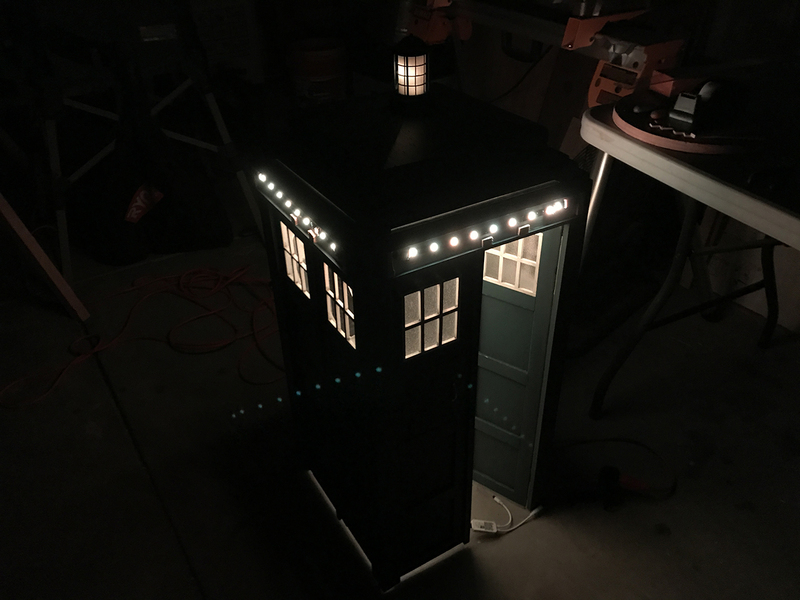 Now on to the lamp. 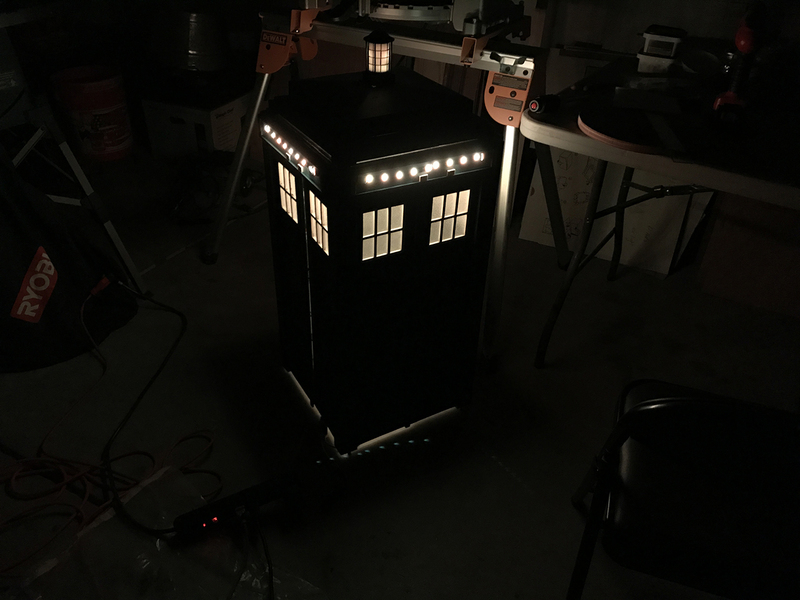 I'd initially sort of stuffed the LEDs into it but I didn't like the unevenness of the illumination. I tried multiple times to wrap the LED strip around a dowel. 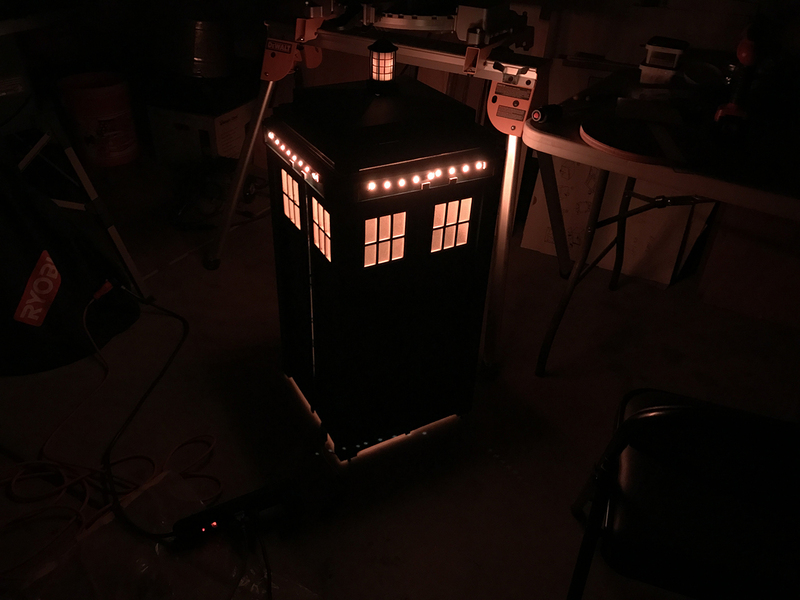 My first attempt (pictured), it turns out the dowel was exactly the right diameter such that when wrapping the strip around it, all the lights ended up on one side. 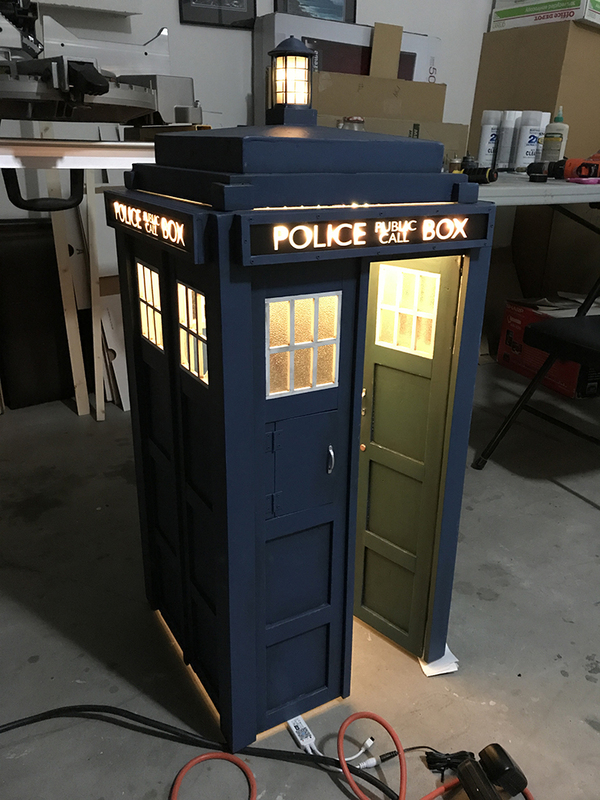 I then tried a smaller dowel, and ended up having all sorts of issues with the green LEDs not lighting up. Red and blue were fine, green was giving me hell. 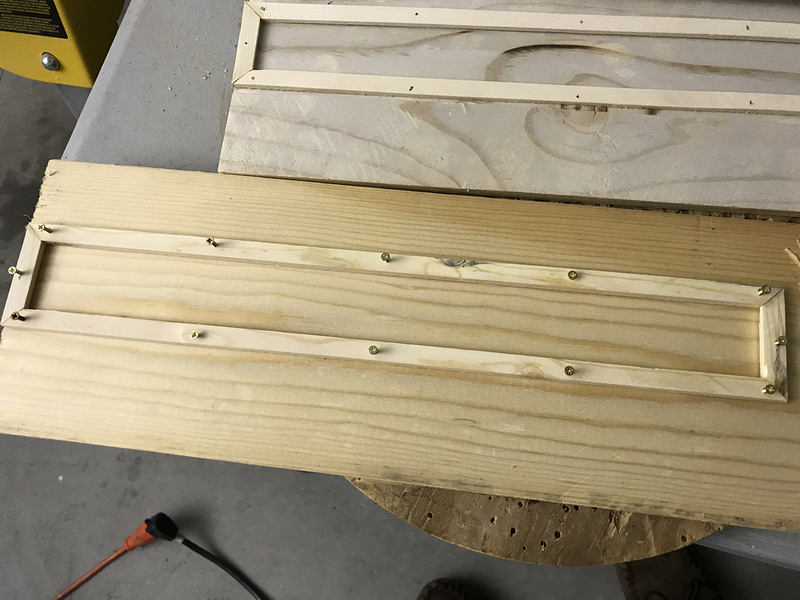 Eventually I gave up on the dowels altogether; the strip was pretty well spiraling on its own (I was spiraling a bit too by that point, truth be told), so I stuffed it in. Turns out the issue with the green LEDs, I'm pretty sure, had to do with my cutting the strip slightly crooked so not all of the metal leads were making good contact with the leads in the plug. I got all that sorted in the end, and it took awhile to hit me that I'm about 98% done now. 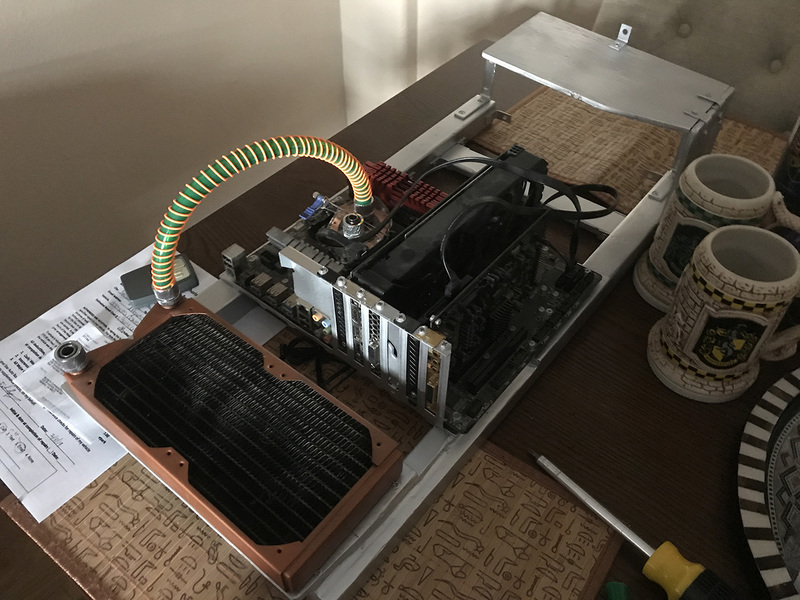 As long as my wife doesn't need her computer anytime soon, I'm going to leave it dismantled until the table is done. That way I only have to reassemble everything once. 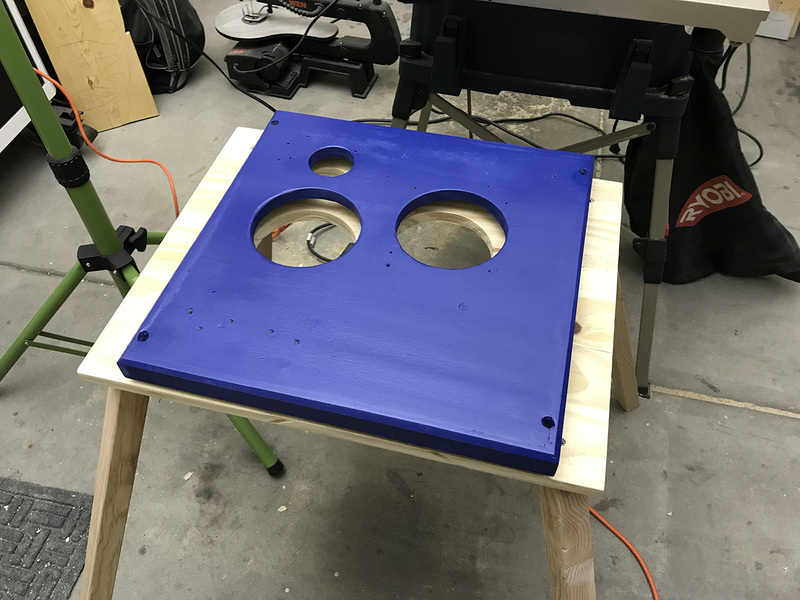 The first time I put the top of the case on the base to test fit, it was REALLY tight. Like, I had to push it down with some force when I'd expected it would drop down easily. 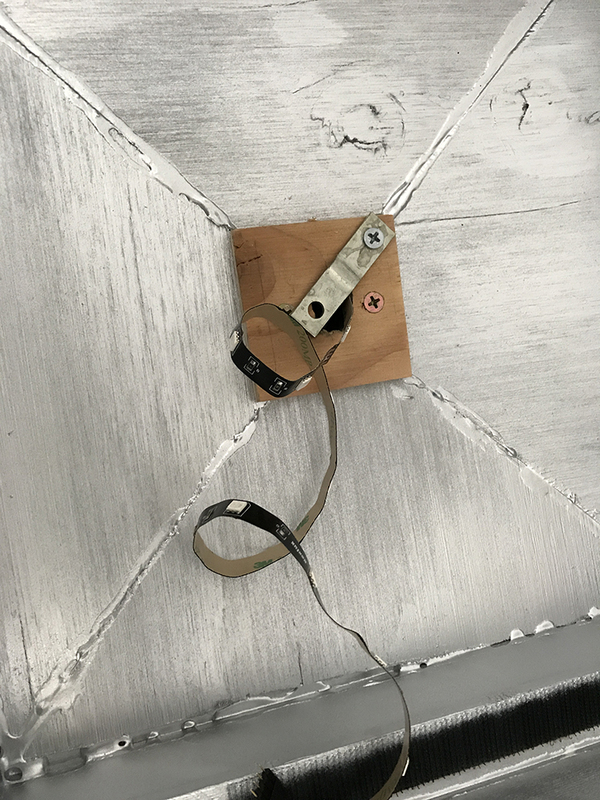 I noticed that the metal motherboard tray had a corner that was sticking out slightly, so I used pliers to bend it back over to the vertical post it's attached to. Also, the inside of the phone box was hitting the motherboard. 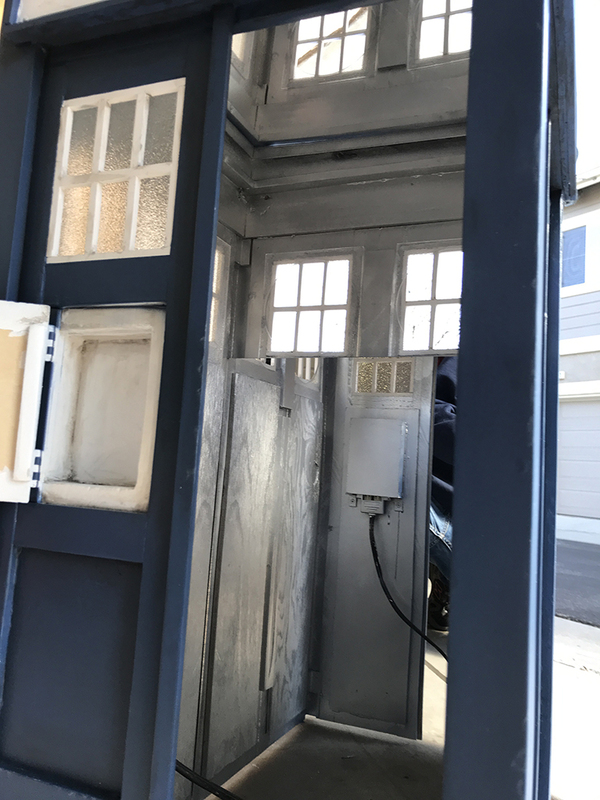 I used my dremel and carved a shallow vertical groove on the inside of the phone box so I'm hoping with these two adjustments the top will fit more easily. The blank spot inside the phone panel door in the previous photo is, of course, where the phone will go. 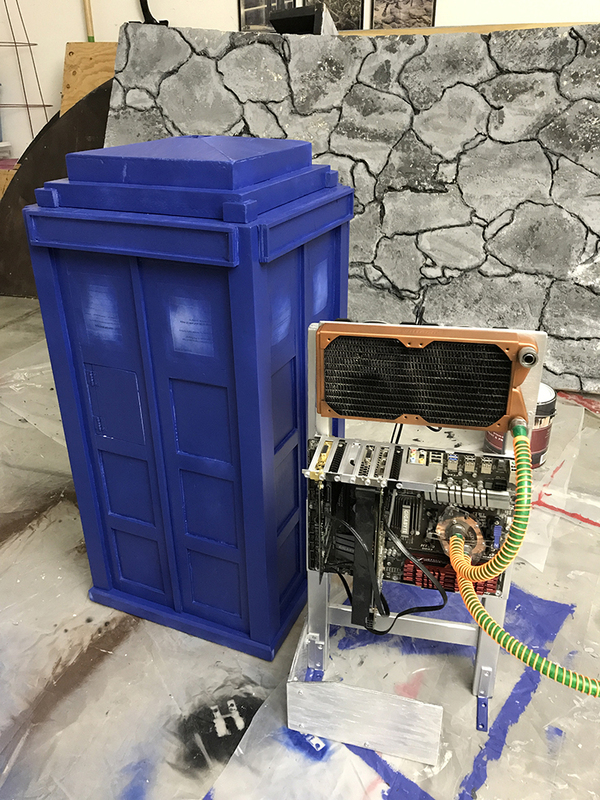 I also put a couple front panel USBs in the bottom of that phone box. 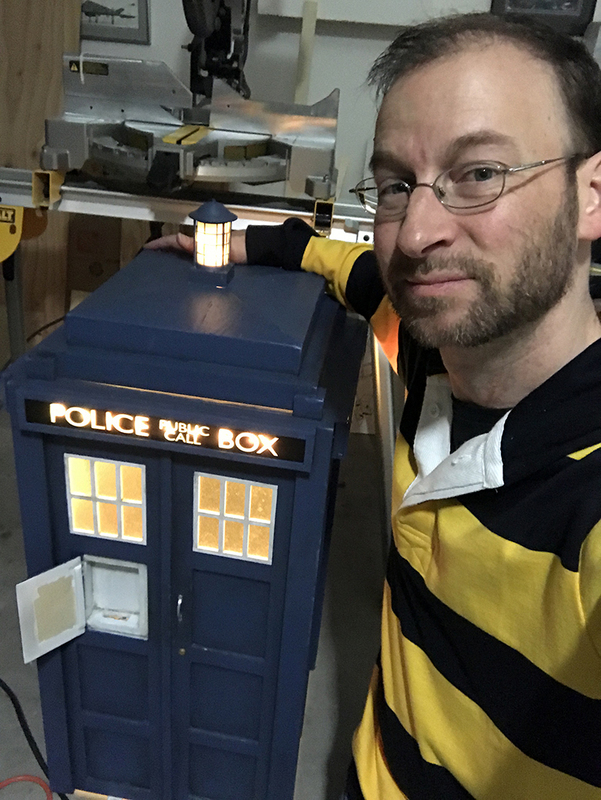 Lastly, here's a selfie of me with it to give a better idea of its size. 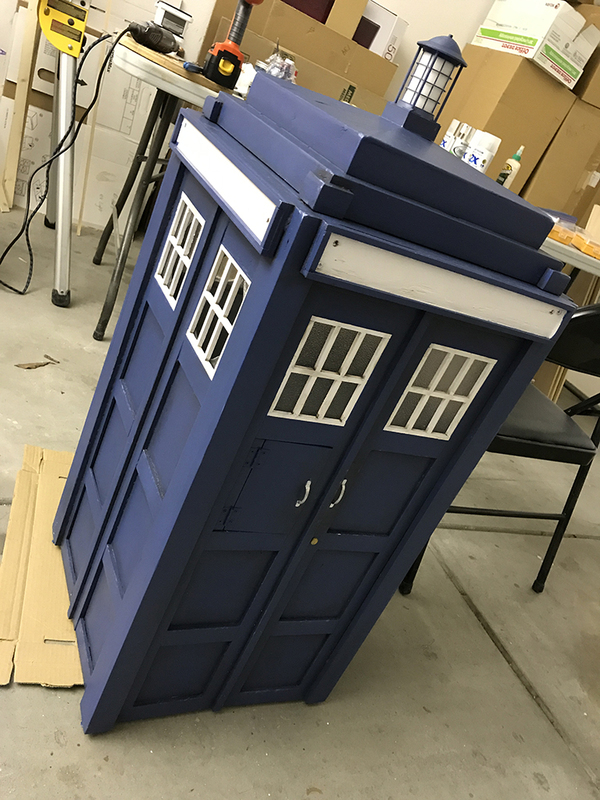 I'm over 6 feet tall but am kneeling to get the TARDIS in the photo. You can also see the light leakage I was referring to earlier. I'll fix that at some point.